Carbon-based evolution. 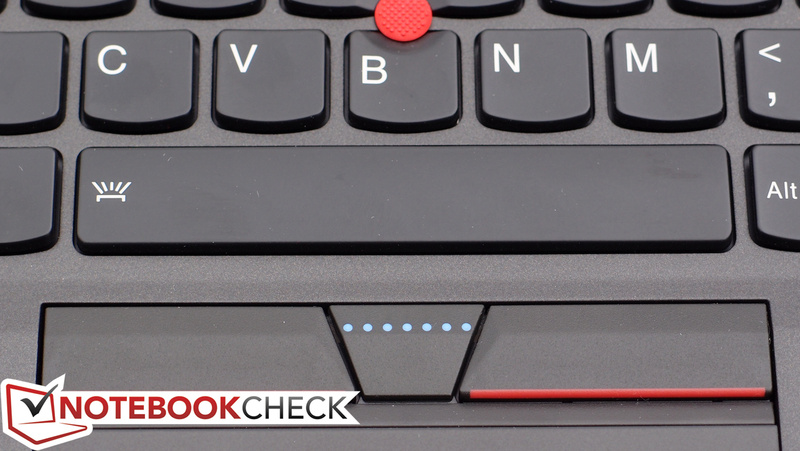 While Lenovo’s ThinkPad X1 Carbon series laptop has always been an impressive piece of hardware, some design decisions have polarized the audience. The X1 Carbon 3rd Gen answers the criticism with solutions which aim to please all parties. We explore the results in excruciating detail in our full review. 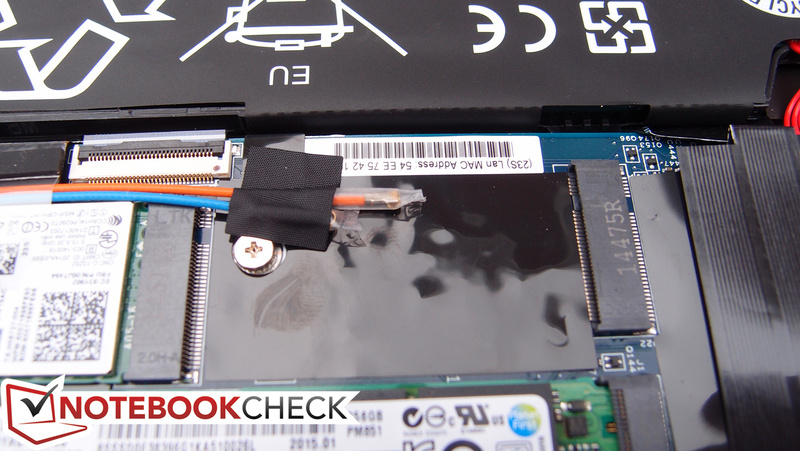 Update 04/20/2015: Core i7 and PCIe-SSD in review! 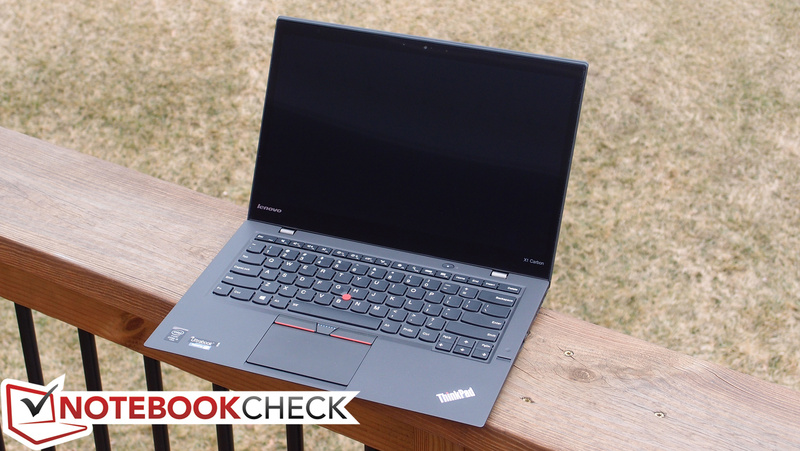 Lenovo’s ThinkPad X1 Carbon made a sizable splash with its sleek ultraportable body and high-end metal hybrid construction, but even through its second-generation (“2nd Gen/Gen 2”) revision, it retained some pretty polarizing features. Chief among them were the input devices: the keyboard (with its capacitive Function keys and unorthodox layout) and touchpad (with its full-depression clickpad design) were acceptable reinventions to some, but to others, they were enough to dispel any further interest in the machine. Subjective as it may seem, far less risky approaches exist, with few affiliated compromises. 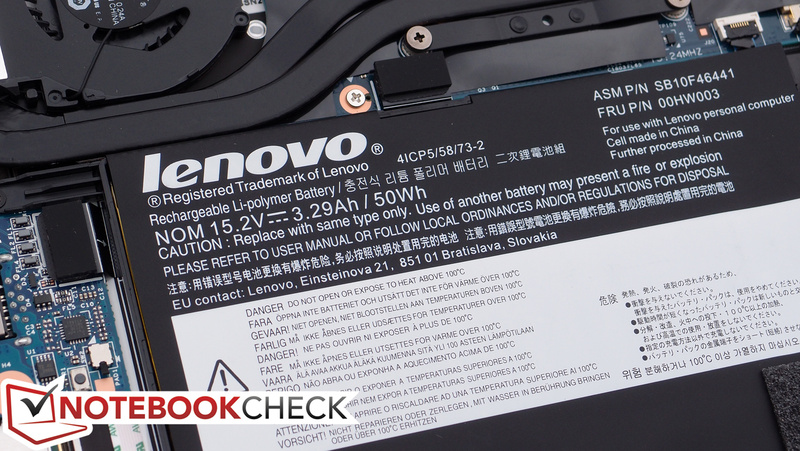 For 2015, Lenovo is back with their 3rd Gen revision, and it’s unmistakable proof that the manufacturer is attuned to the criticism of its community. Not only has the chipset seen an update to the latest Intel ULV Broadwell CPUs—in the case of our $1,574 review unit, specifically, the Intel Core i5-5300U—but the keyboard and touchpad have undergone a complete overhaul, relegating the old designs to distant memories. Other adjustments have also been made—such as the inclusion of a Thunderbolt port and an increase in the size of the internal battery—but the rest of the package remains strikingly similar to the original. And that’s not a bad thing: we had very little criticism for the machine in our previous reviews, apart from items relating to the above. 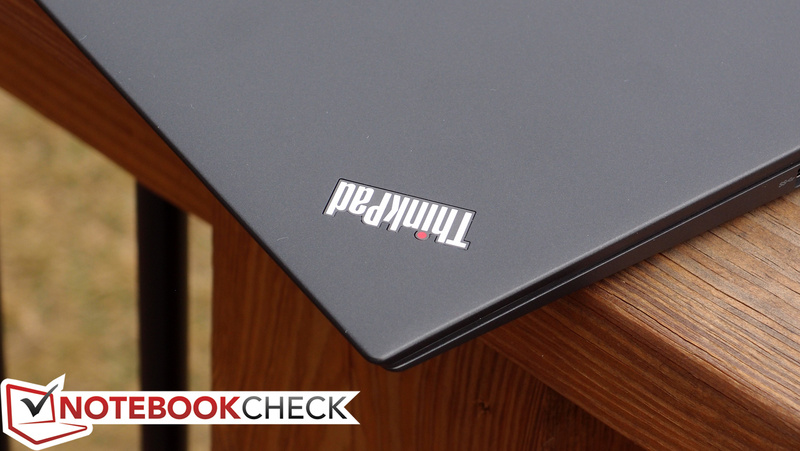 So, can Lenovo’s evolutionary improvements to the X1 Carbon propel it onto our short list of modern Ultrabooks? As always, we’ll let our measurements and math do the talking. 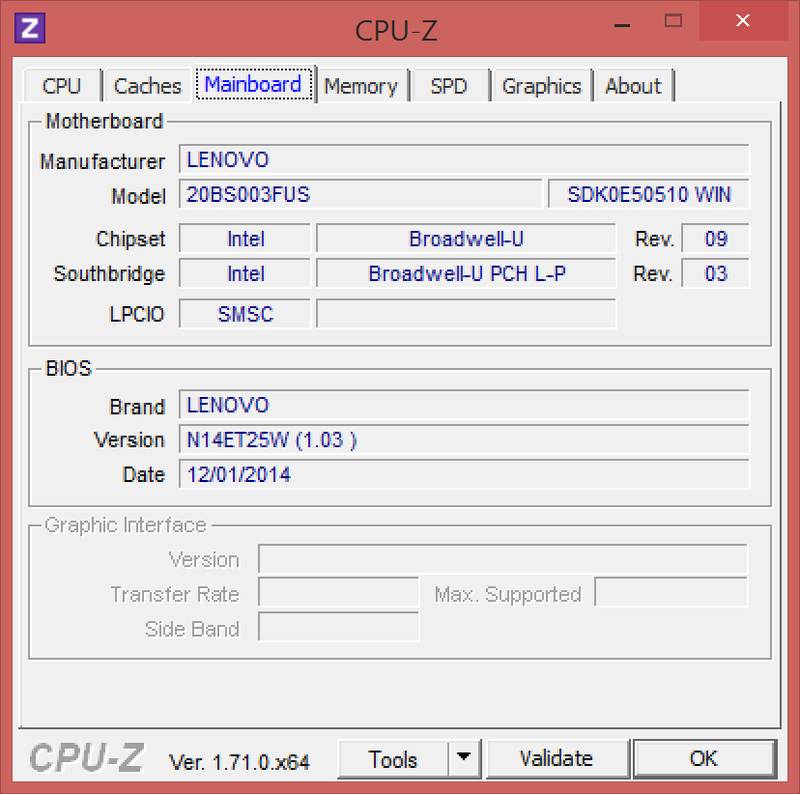 Update 04/20/2015: Benchmark results with the Core i7-5500U processor and PCIe-SSD added. 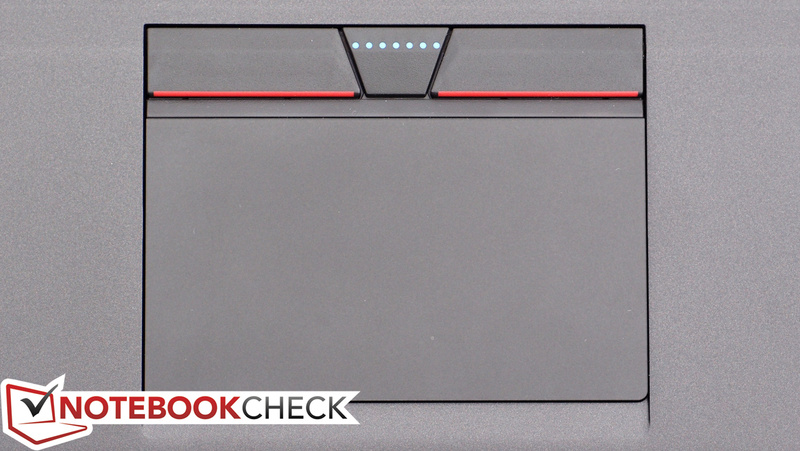 As far as impressions go, the X1 Carbon’s case features an obvious attention to craftsmanship and style that few other business PCs can boast. 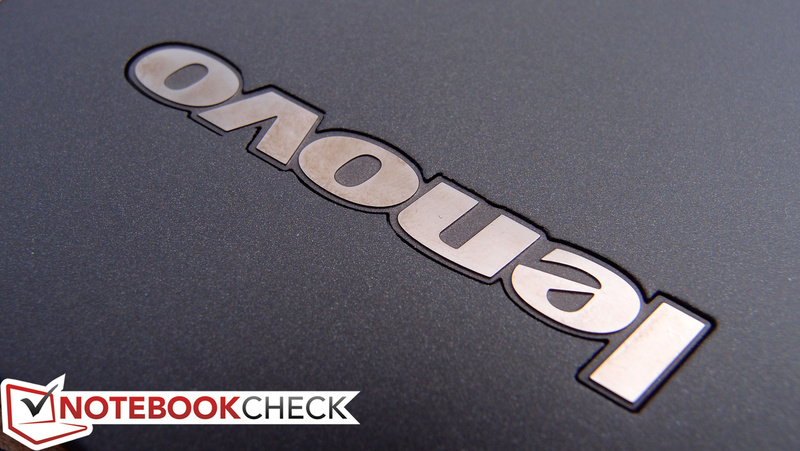 For starters, Lenovo boasts that it’s the lightest 14-inch business Ultrabook available, at just 1.408 kg (and 19 mm thin). The base unit’s magnesium/aluminum surface is cool to the touch, yet smooth and comfortable. It also rests well on the lap, though the unfortunate placement of the intake vent on the bottom-right of the PC can be blocked by a poorly-placed leg while lap-borne. All of this style and portability does come with strings attached, however: an area of concern with the previous X1 Carbon candidates was that of rigidity, and once again, the Gen 3 Carbon does exhibit a notable degree of flex, both while resting on a hard surface and when picked up and subjected to twisting. 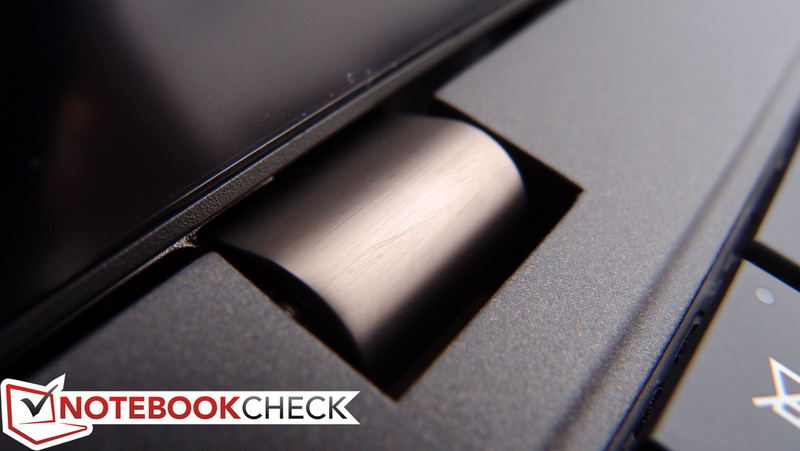 In our test unit, moderate pressure along the casing surrounding the touchpad resulted in audible clicking and popping, and the material visibly flexes in the process. Meanwhile, the display lid, which is built from carbon-fiber and glass-fiber reinforced plastic, twists fairly easily—though beyond mere torsion resistance, its protection against pressure from behind actually seems better than expected, as no distortions are visible on the LCD panel under any normal degree of stress. None of this yields a sensation of legendary durability, however, so it’s still a bit of a disappointment, especially when viewed alongside competing ultraportable powerhouses such as the MacBook Air or Dell XPS 13-9343. 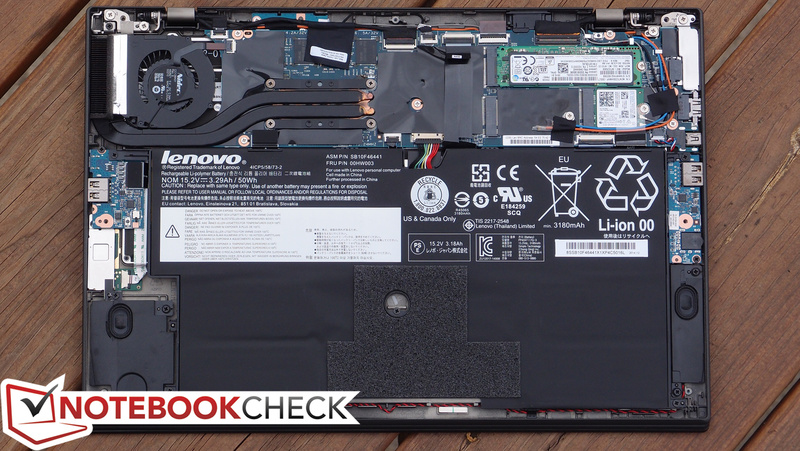 To allay some concerns, Lenovo does promise that they’ve subjected to the notebook to intensive MIL-STD 810G testing, qualifying it for uninterrupted operation in situations of extreme humidity, temperature, altitude, vibration, and dust. 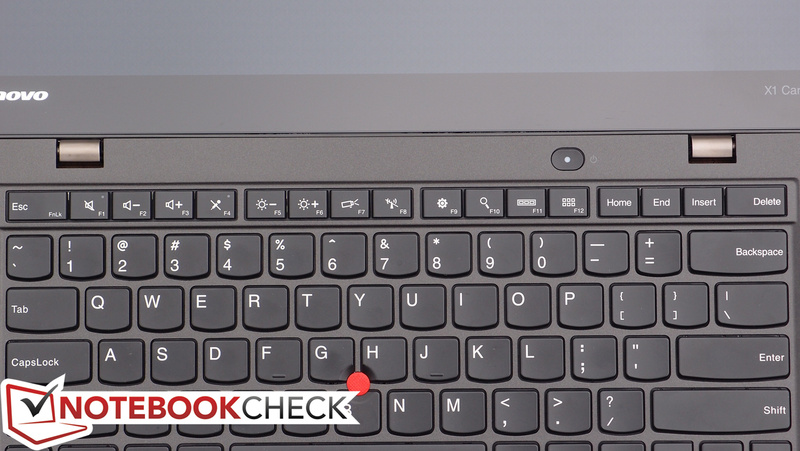 In comparison to the best Ultrabooks, the X1 Carbon’s hinges are also a bit on the wobbly side, though this is probably due in part to the larger-than-average screen for its class (14 inches diagonal). 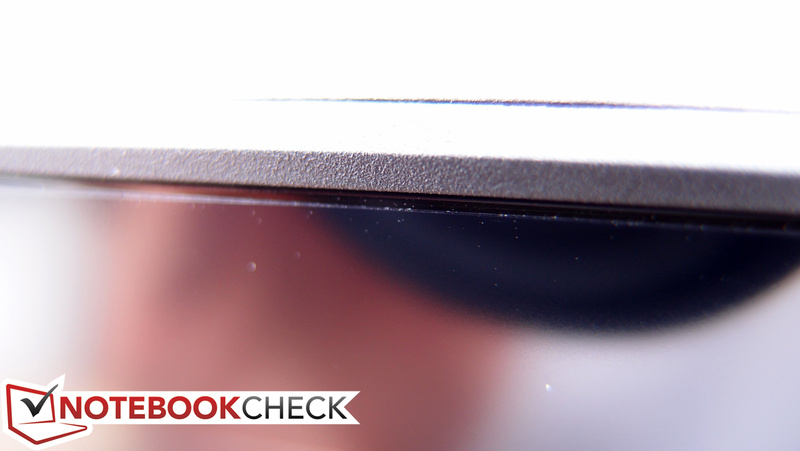 The implications of the wobble are reduced by the semi-anti-glare screen filter, but it is nevertheless a nuisance. 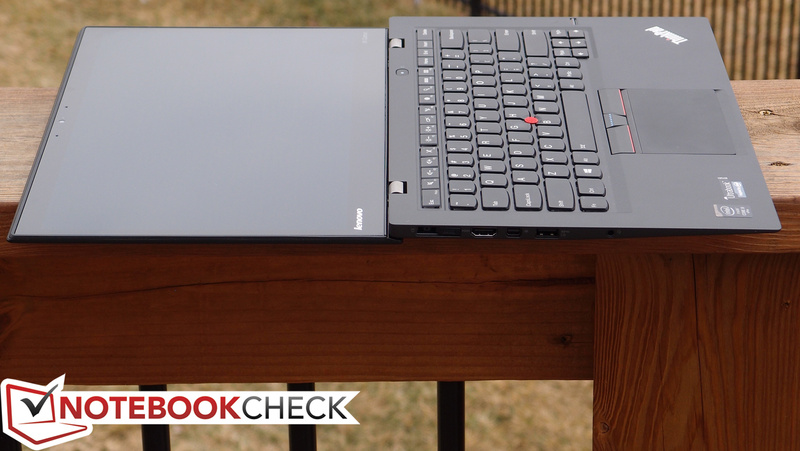 Finally, on the subject of maintenance, the X1 Carbon lives up to its obligations as a business device. The machine’s innards are easily accessible via a series of 7 Phillips-head screws securing the bottom panel, which can then be effortlessly lifted off to reveal all of the major replaceable components. This includes the M.2 SSD, WLAN adapter, heatsink/fan, battery, and speaker assemblies, as well as the WWAN card if one is installed (it was absent on our review unit). One item which remains out of reach is the system RAM, which is once again soldered directly to the board. 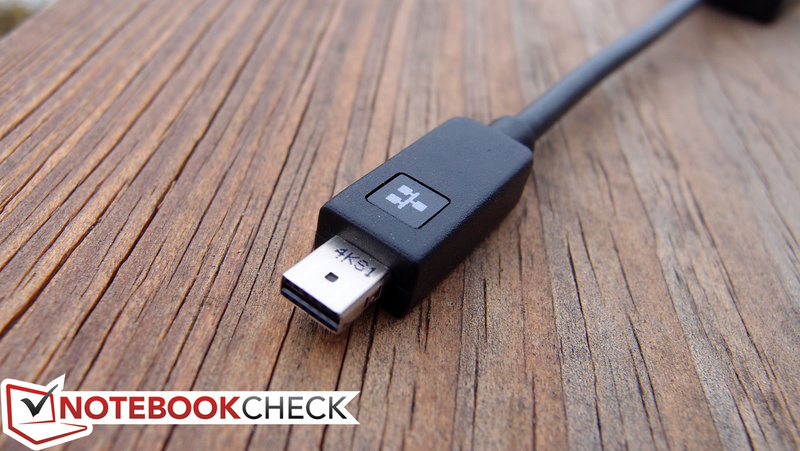 The X1 Carbon makes good use of its available edge real estate via the inclusion of both mini-DisplayPort and ­full-sized HDMI (1.4) for video output, along with two USB 3.0 ports (one Always On). 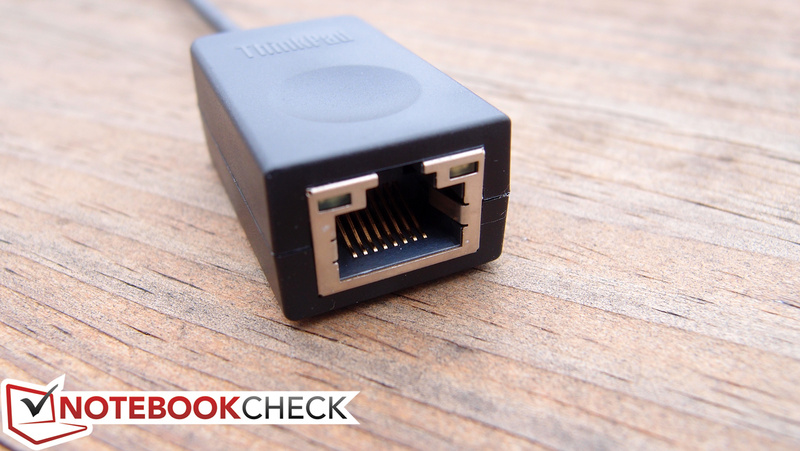 You’ll also find the same proprietary Ethernet port (for use with the included ThinkPad Ethernet Expansion Cable adapter), which is a welcomed decision, as it allows for Ethernet connectivity without having to sacrifice one of the USB ports in the process (or, in the case of the Dell XPS 13-9343 for instance, downgrading the USB speed to 2.0 as a result). Finally, there’s the OneLink port which is attached to the charging port, for use with a Lenovo OneLink (or OneLink Pro) dock. Still, we would have loved to see an SD card reader on top of it all, and certainly another USB port somehow; for a 14-inch business machine, the selection is certainly a bit constrained. Port placement is mostly unproblematic, though we did find that while the Ethernet Expansion Cable adapter is attached, it can be difficult to attach a larger USB device adjacent to it. 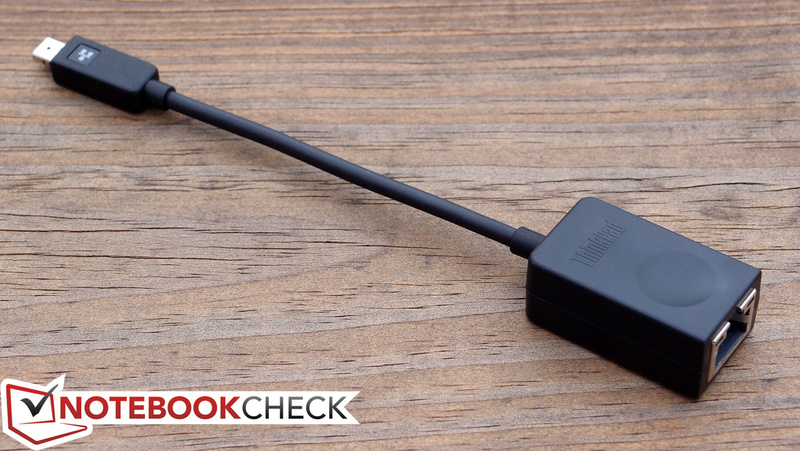 The ThinkPad X1 Carbon’s Intel Dual Band Wireless-AC 7265 802.11ac WLAN adapter is a 2x2 implementation capable of wireless speeds up to 867 Mbps. 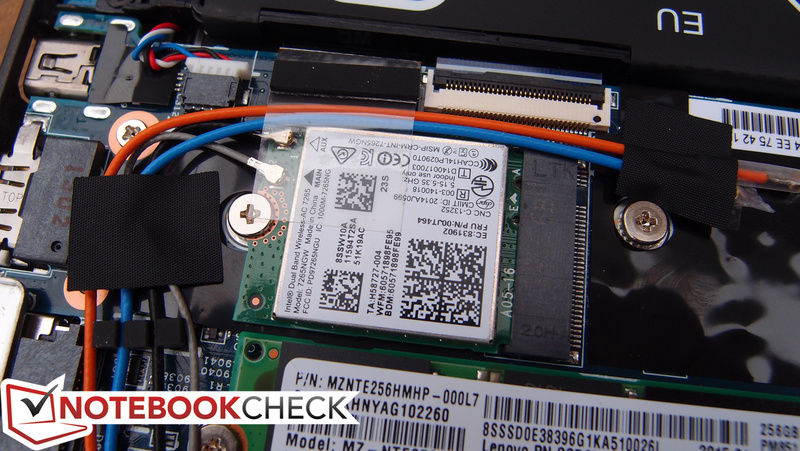 Signal strength was never an issue in any scenario that we tested, which places the X1 Carbon a notch above the XPS 13-9343 (at least, with the available drivers at the time benchmarks were performed). This adapter also includes integrated Bluetooth 4.0. As mentioned above, the X1 Carbon also supports native Gigabit Ethernet connectivity via connection of the included ThinkPad Ethernet Expansion Cable—a solution which is decidedly superior to that of most other notebooks—again, including the XPS 13-9343—which typically require a USB 3.0 port. During our testing, this solution worked well, though it is worth mentioning that during heavy file transfers we witnessed odd pointer jumpiness and system hiccups. 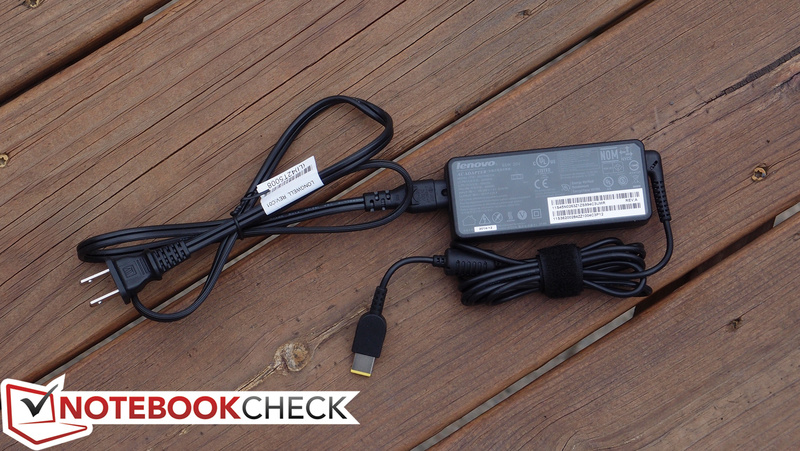 The X1 Carbon ships with a small (294 g) 65 W AC adapter, as well as a ThinkPad Ethernet Expansion Cable as pack-in. The suite of preinstalled software on the X1 Carbon is fairly extensive—and that’s not a compliment. You will find a number of “value-added” programs, including Maxthon Cloud Browser, Norton Internet Security, Pokki Start Menu, Nitro Pro 9, Evernote Touch, SHAREit, The Weather Channel, and the usual array of Lenovo applications. Fortunately, most of these are very easily removed should the user wish to spend 10 to 15 minutes upon receipt of the machine doing so. 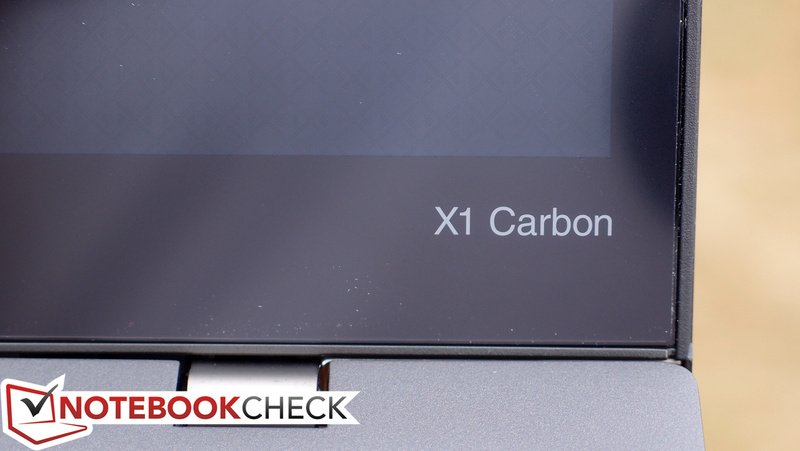 The X1 Carbon includes a 1-year depot (or Carry-In) warranty. As is typical, upgrades to in-home service, longer warranty terms, and Accidental Damage Protection are available at a premium. The first of the major improvements to the X1 Carbon Gen 3 we alluded to in our introduction regards the keyboard design. Unlike the Gen 2’s obtuse layout (also the result of an experimental design change arguably gone too far), the new keyboard is thankfully back to normal. Gone are the goofy capacitive, dynamic function keys, replaced once again by the familiar F-keys of yore. Likewise with the ridiculous split keys (such as BackSpace/Delete on the Gen 2); these have once again been restored to their former selves, thus eliminating the need for any unnecessary adjustment to exotic layouts. Caps Lock is also back. The mechanical qualities of the keyboard remain excellent. Key travel is very good for an Ultrabook, actuation force is comfortable, and feedback is great. The keys are tightly affixed and feature smooth, comfortable surfaces which do tend to collect oils from the skin, but which are nevertheless easily wiped clean. 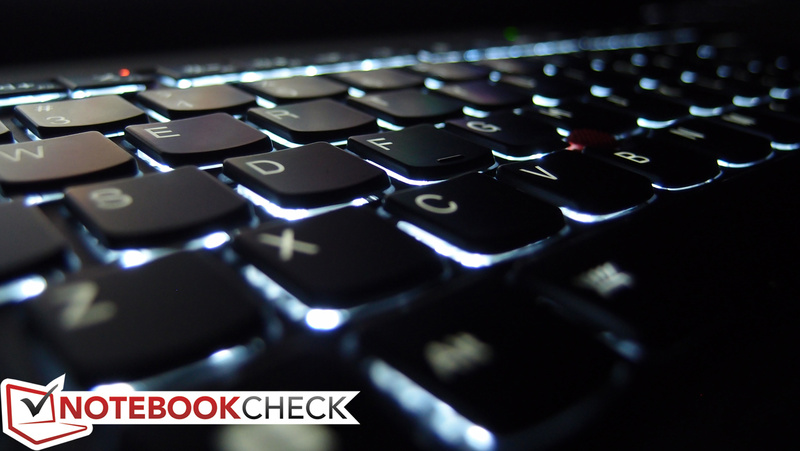 The keyboard is also backlit with three total levels of brightness (off, low, and high). 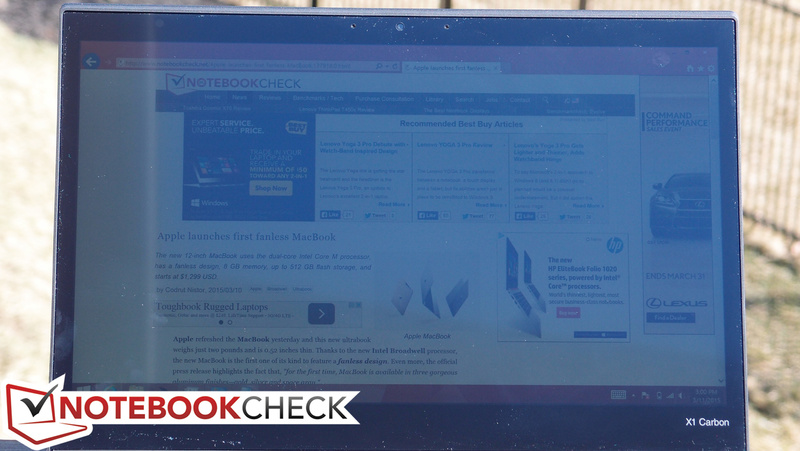 Overall, it’s one of the best available Ultrabook keyboards by our judgment. 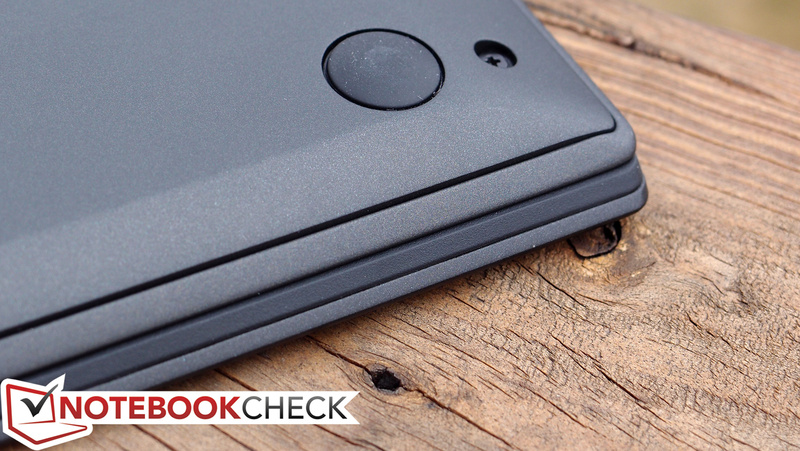 In undoing its previous experiments, Lenovo didn’t stop there. While the keyboard on the Gen 2 was certainly jarring, the touchpad was arguably no easier to operate with its full-depression “five button” clickpad design, which many people found to register unintended clicks and just generally complicate matters as it applies to click-and-drag and other fundamental navigational maneuvers. Furthermore, it rendered control with the TrackPoint especially frustrating. Fortunately, the Gen 3’s Synaptics pad completely overhauls this as well, adding back two conventional mechanical buttons atop the touchpad (for use with the TrackPoint, but also optionally with the touchpad), as well as doing away with the radical full-pad click design and replacing it with far more palatable integrated buttons at the bottom. These integrated buttons are not only superior in terms of comfort (and easier to activate, no less), but they’re considerably quieter than the Gen 2 clickpad, to boot. 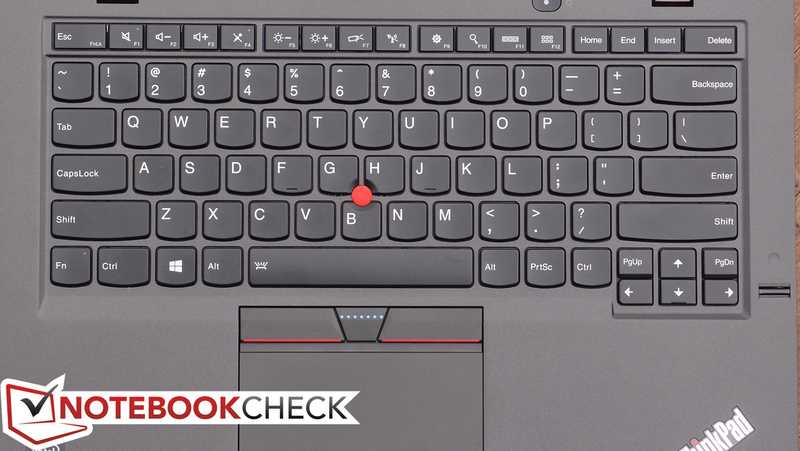 Gone is the pointer jumpiness we experienced with many of the drivers and pointing devices on previous-generation ThinkPads. 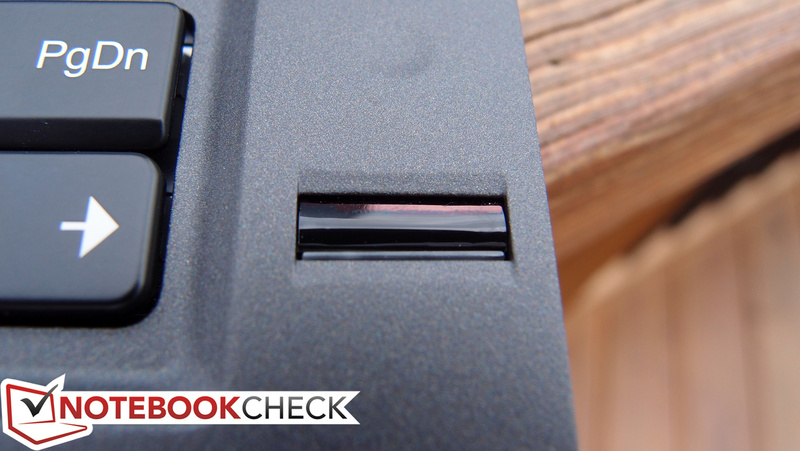 Finally, the TrackPoint (needless to say) has experienced a return to form as a result of the resurrection of the two physical buttons—so users who are comfortable with that method will be pleased with the results. 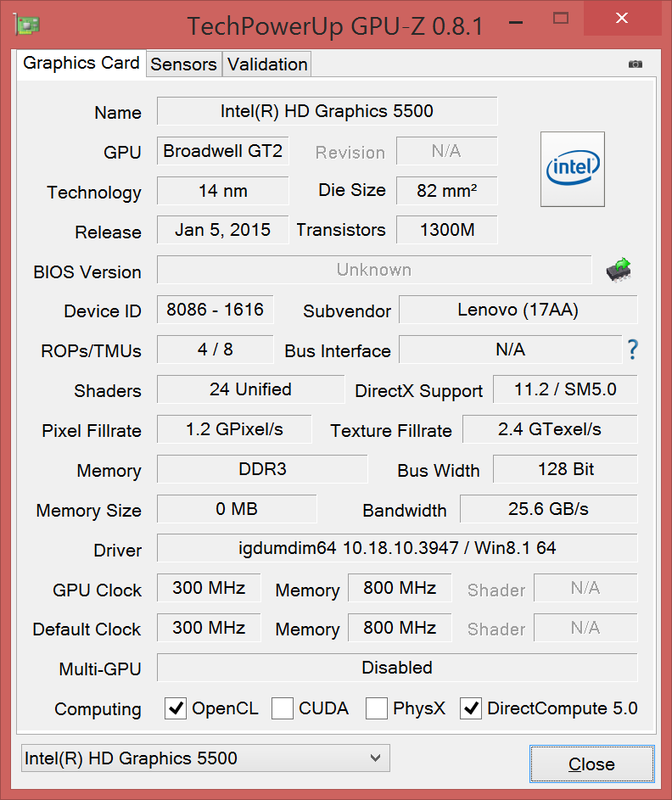 While other OEMs have opted for Microsoft Precision touchpads (which have received some mixed feedback, primarily due to finicky operation in some third-party applications and a general lack of available driver options), Lenovo’s Synaptics implementation still leverages the legacy Synaptics drivers, which are perhaps superior in many regards, and which at the very least provide a comparatively vast array of customization options. In summation, the changes to the input devices are an incredibly positive reversal of experimental design which is sure to satisfy most consumers—especially those with such cultivated mobile computing tastes as the ThinkPad audience. 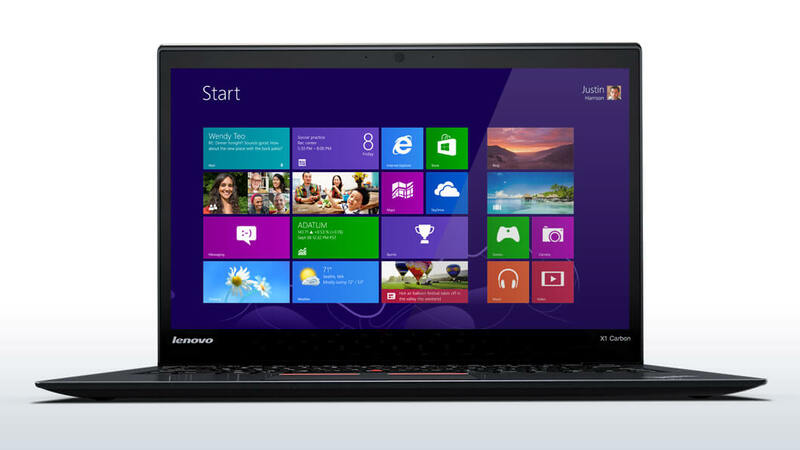 The X1 Carbon’s touchscreen display is responsive and comfortable to operate. The anti-reflective film covering the panel surface makes for fluid finger gliding and relatively easy cleaning of fingerprints. The X1 Carbon’s display is a 14-inch WQHD (2560x1440) IPS touch panel with a semi-matte (anti-glare) coating. 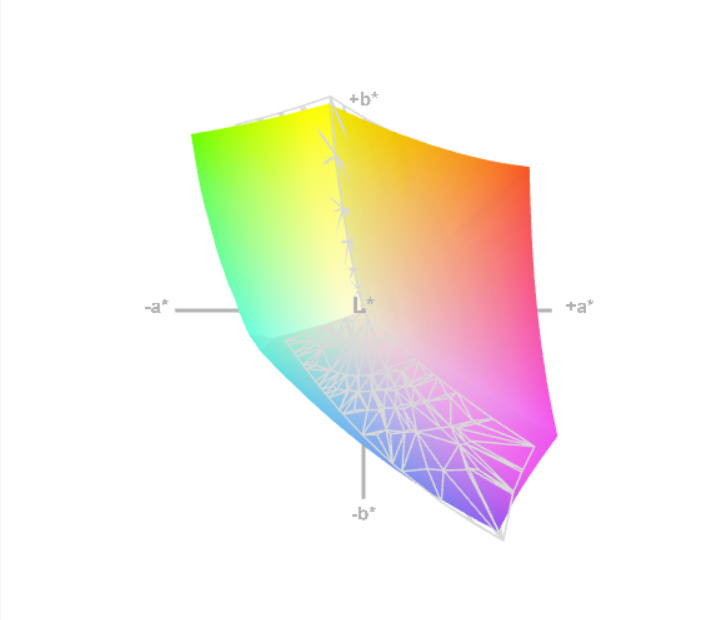 What we mean by semi-matte is actually mostly matte, but not quite as diffusive of reflections as the least glossy panels; a good comparison would be many modern LED HDTVs or many of the LG and Samsung panels that are found in modern laptops. 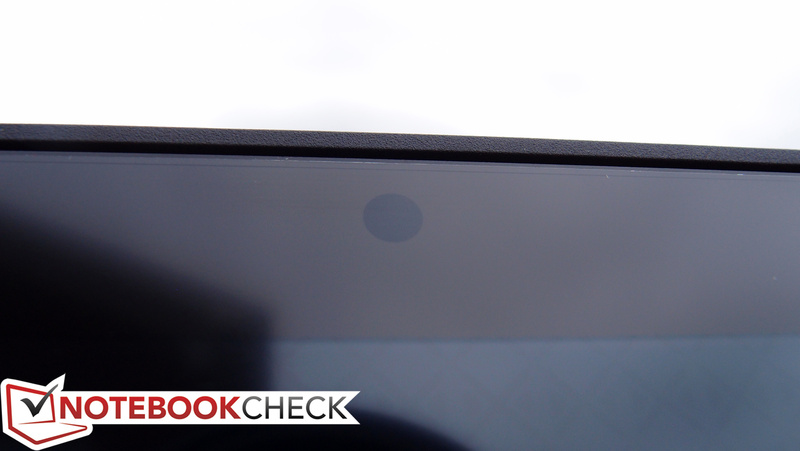 The matte filter is actually applied overtop the panel and is visibly separate from the surface of the touchscreen itself. 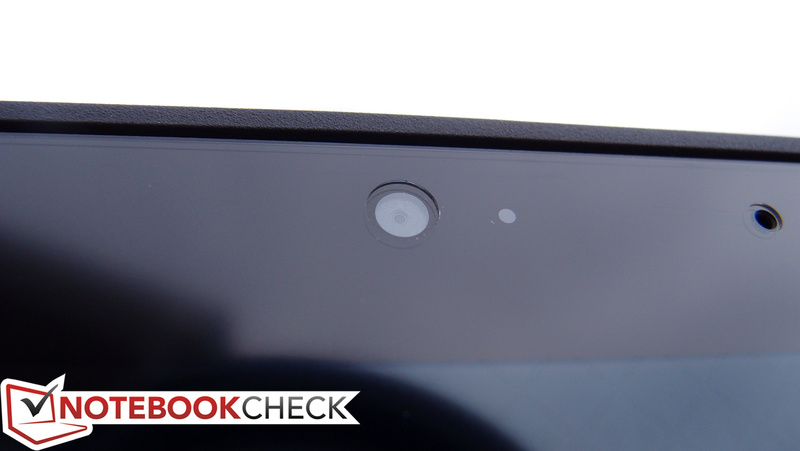 For the most part, though it does produce an ever-so-slightly grainy effect, it’s better than dealing with the reflectivity of a glossy screen. 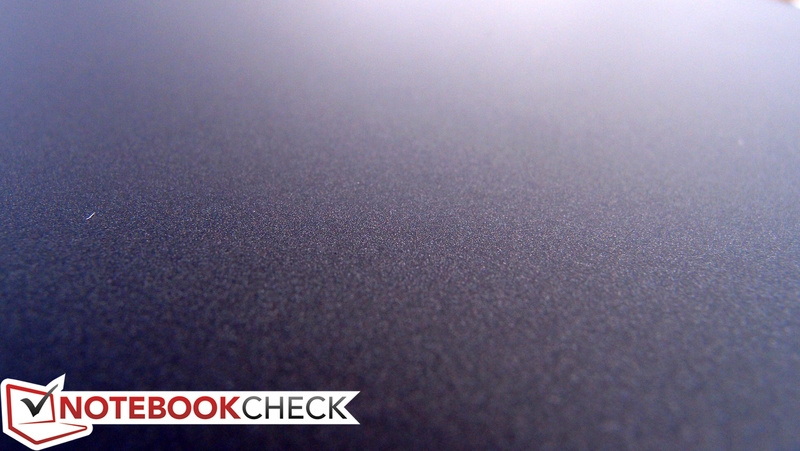 As an added bonus, the filter also makes it somewhat easier to clean the screen of fingerprints. The X1 Carbon’s screen resolution and size grant it a density of nearly 210 PPI, which is certainly enough for practical purposes, but which is below that of many competitors (for instance, the XPS 13-9343’s 276 PPI). 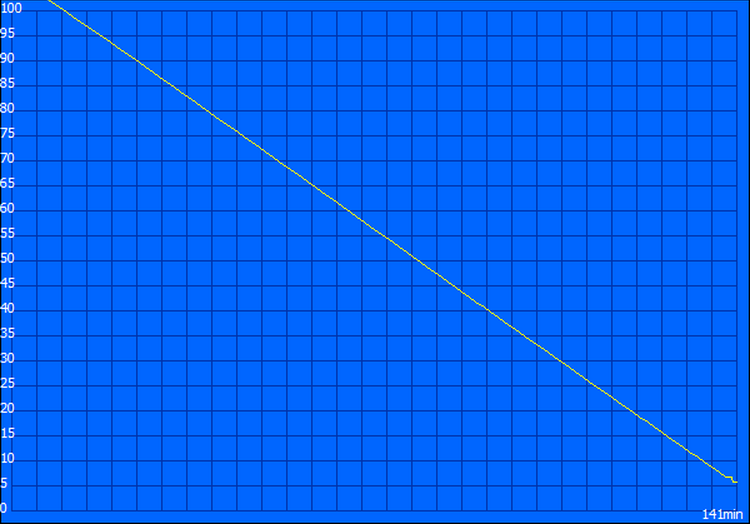 Subjectively speaking, the color quality is average, and contrast appears to be nothing special. Unsurprisingly, that’s precisely what our measurements reveal. For starters, the maximum brightness of the panel can hardly compare to the best and brightest panels we’ve encountered at a mere 252.7 cd/m². 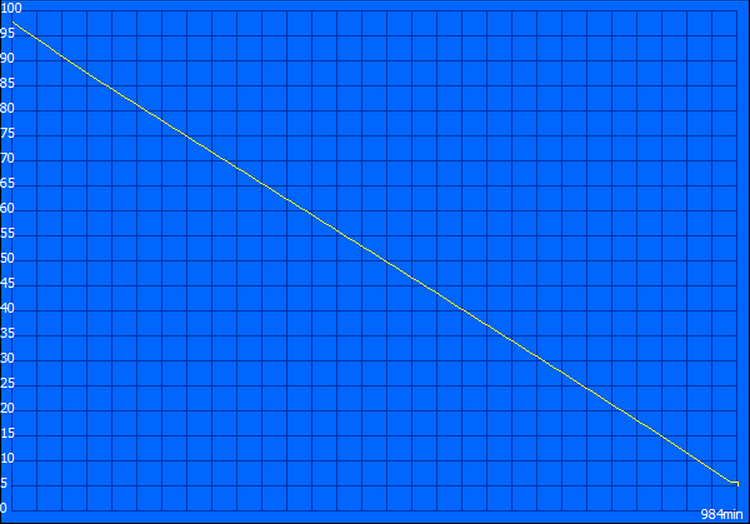 On average, the panel only manages 245.6 cd/m² (second test device: 248 cd/m²) — though on a brighter note the closeness of those values reveals an excellent brightness distribution (95% in this case—nearly perfectly uniform). 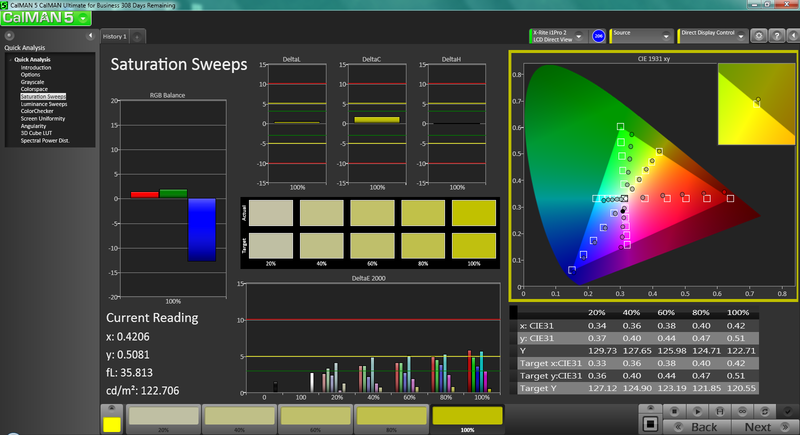 As it compares to the XPS 13-9343, for instance, the X1 Carbon’s average brightness is over 125 cd/m² lower. At least the Gen 3’s brightness is somewhat superior to the Gen 2’s mediocre 225.8 cd/m². 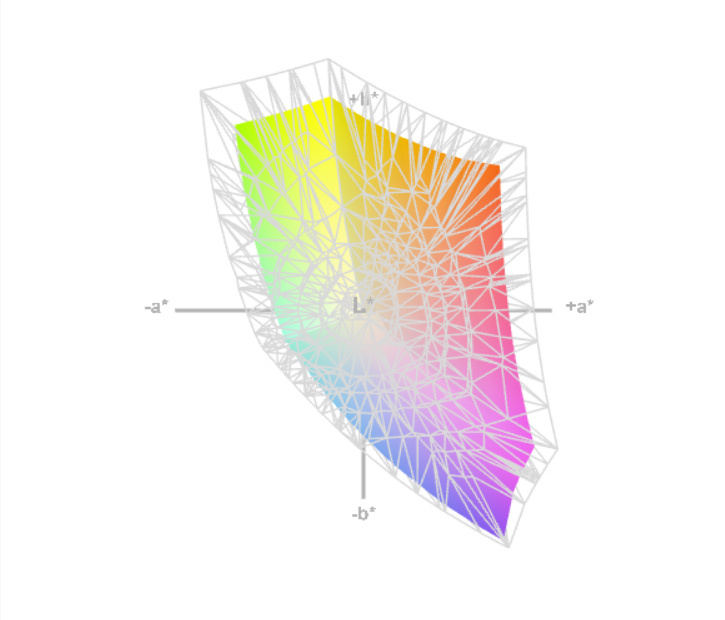 In terms of contrast, the high black value of 0.426 cd/m² makes for an unimpressive 592:1. That’s as compared to the 991:1 of the Gen 2 model we reviewed and the astronomical 2063:1 of the XPS 13. The color quality of the panel also leaves plenty to be desired, covering just 69% of sRGB (Dell XPS 13: 85%). 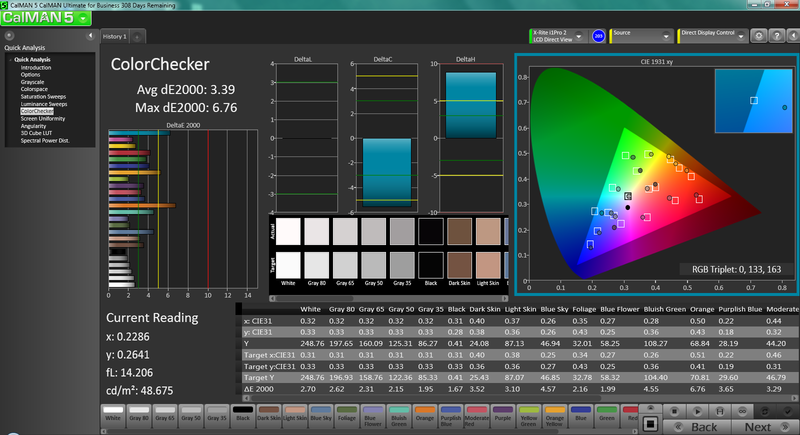 On the other hand, accuracy is fortunately quite good with a ColorChecker deltaE2000 average of only 3.8. 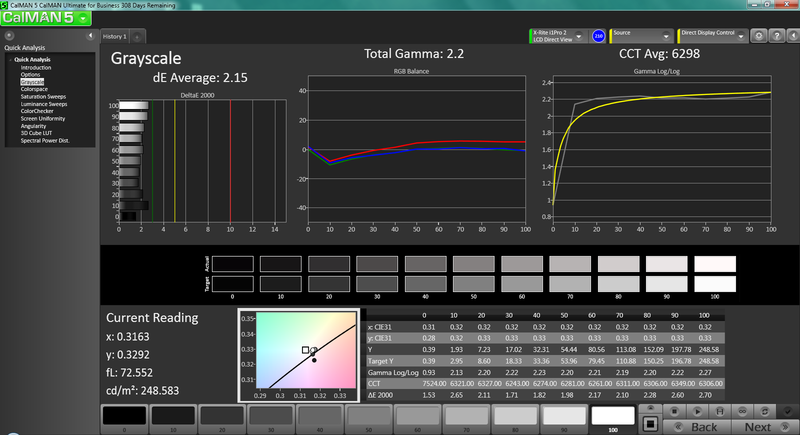 Post-calibration, that number drops even below 3.4—hardly even noticeable to the naked eye. Couple that with a Total Gamma value of 2.2 (ideal: 2.2) and a grayscale dE average of 2.15 (both post-calibration) and the situation looks considerably brighter. Outdoors, the panel holds its own thanks to its semi-matte panel finish—however, depending on the makeup of the environment, it sometimes struggles more than it ought to due to the low brightness and contrast. 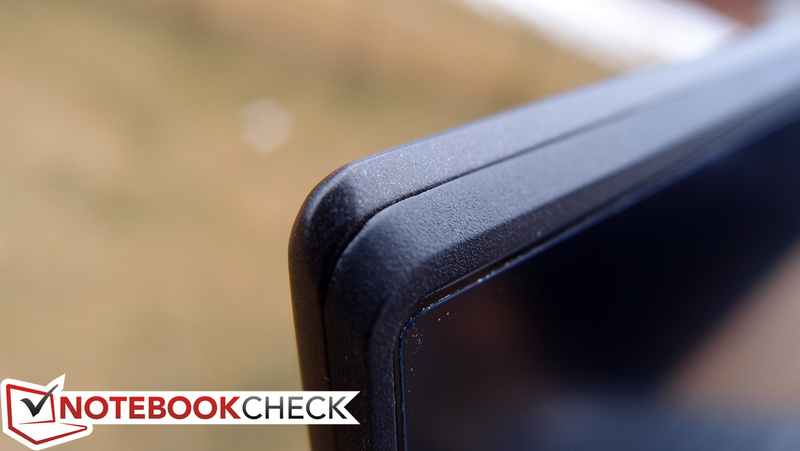 Viewing angles, meanwhile, are as good as any we’ve come to expect from an IPS panel. 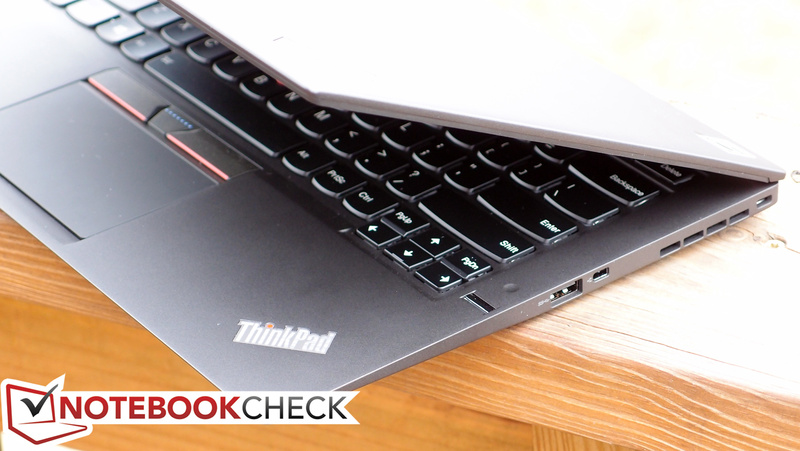 At the lowest end of the spectrum, the X1 Carbon still packs a perfectly respectable Intel Core i5-5200U (up to 2.7 GHz). 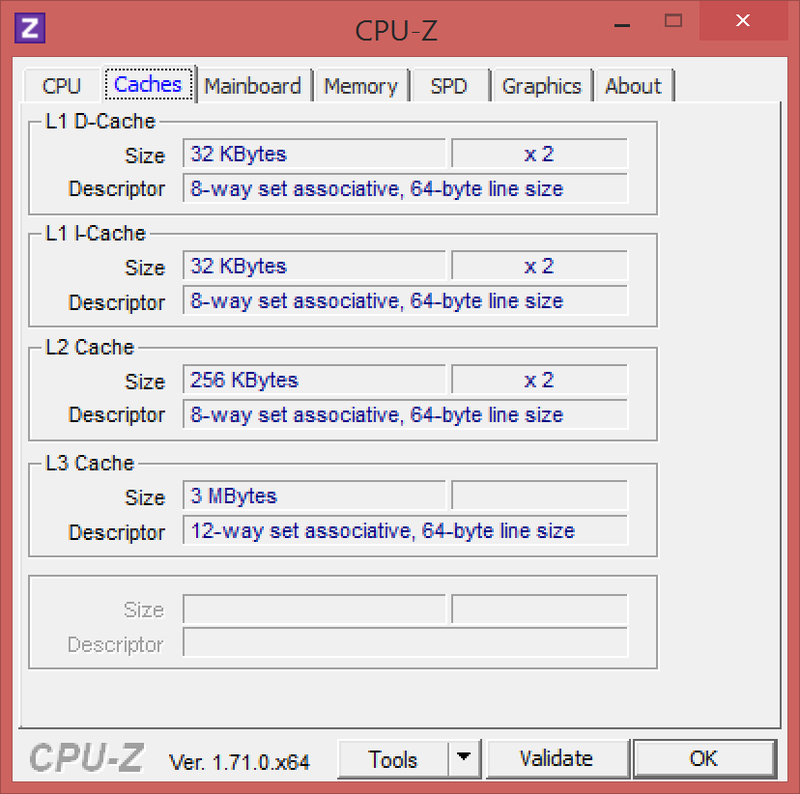 The top-end CPU, meanwhile, is the i7-5600U (up to 3.2 GHz)—and it also is only available when paired with 8 GB of RAM. Still, the massive premium of $450 over the i5-5200U model seems a bit extreme. Our review model inhabits a much more reasonable middle ground with a Core i5-5300U (up to 2.9 GHz). This configuration can be equipped with either 4 GB or 8 GB of DDR3L RAM alongside it; our unit features 8 GB. Bear in mind that whatever choice the user makes here they’re stuck with; since the RAM is soldered directly to the board, it is not possible to upgrade memory. 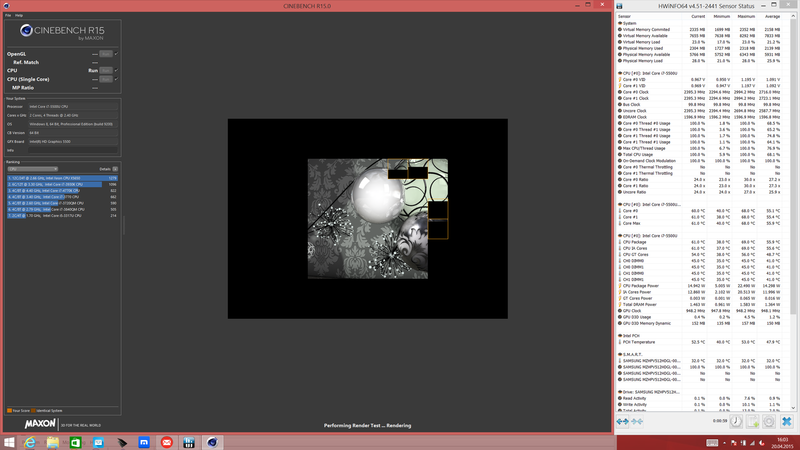 A subsequent run of 3DMark 06 while running unplugged produced a result of 6214. That’s 11% below the original value of 6978 we received, and it suggests that performance on battery is somewhat reduced on the X1 Carbon. 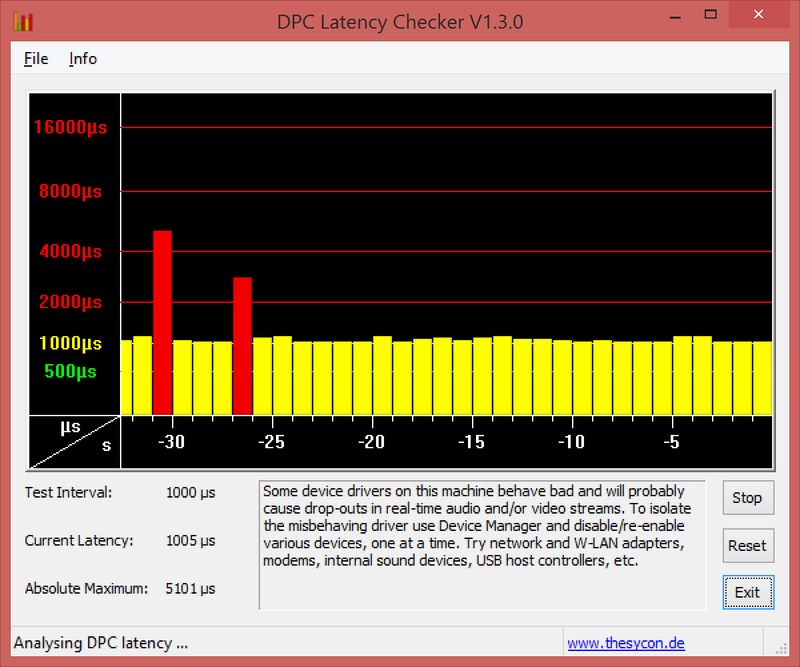 Finally, a run of DPC Latency Checker revealed considerable latency spikes (over 5 microseconds) which appeared to be resolved after disabling the WLAN adapter. 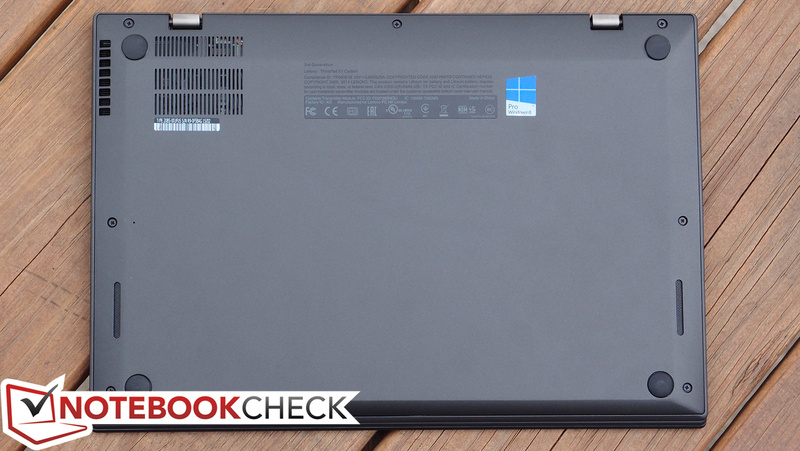 As mentioned above, our review unit includes the middle-of-the-road option of the three CPUs available for the X1 Carbon: the Intel Core i5-5300U. 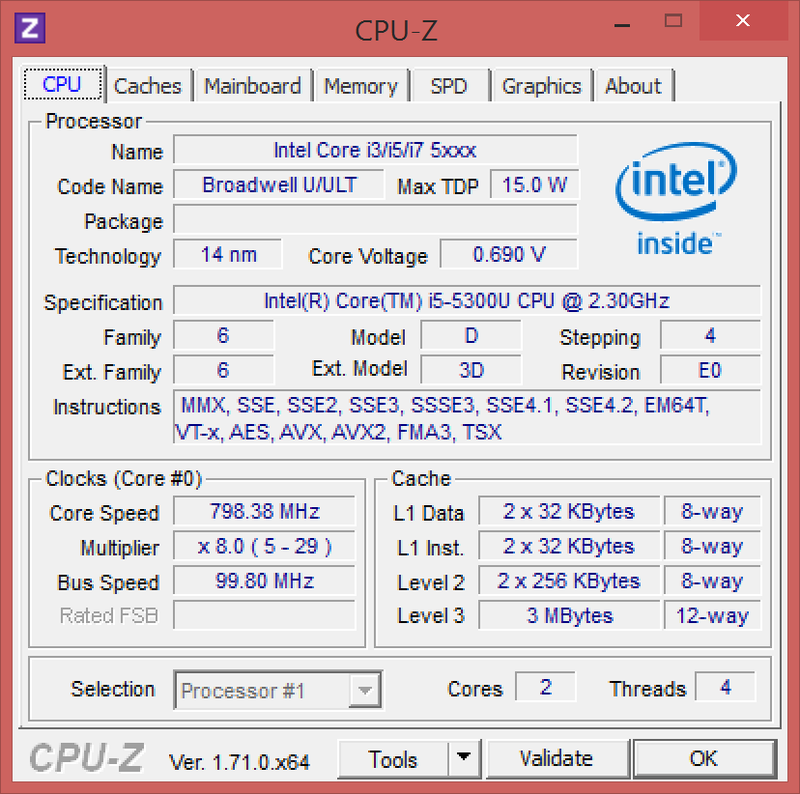 This is a dual-core CPU based on the Broadwell architecture with a clock rate ranging between 2.3 GHz and 2.9 GHz single-core (2.7 GHz multi-core). It carries a 15 W TDP, but thanks to numerous efficiency improvements (including a 14 nm process and FinFET transistors) it ought to be easier on battery than its Haswell predecessors. 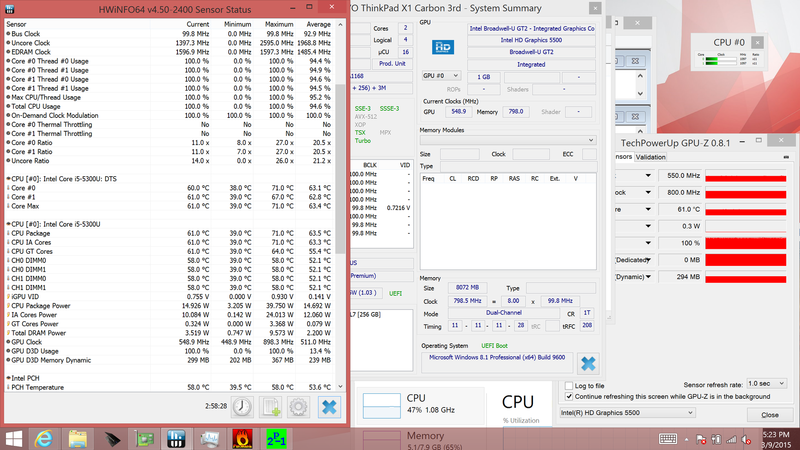 Also as a result of these improvements, the 5300U scores higher than even the Haswell Core i7-4510U. 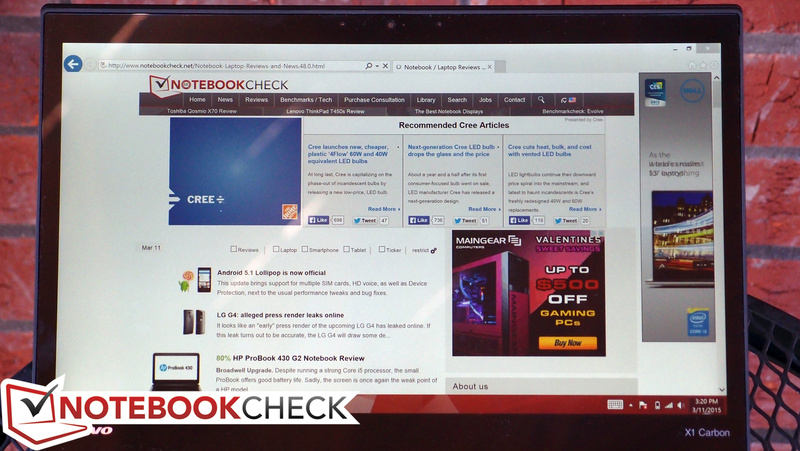 We’ve only seen a few other notebooks to date featuring the same CPU, and for the most part, they’re all pretty comparable in terms of computing performance. However, the X1 Carbon was curiously the lowest-performing candidate in our multi-core tests (by a difference of anywhere from 6 to 12%), which is odd, though not really concerning. 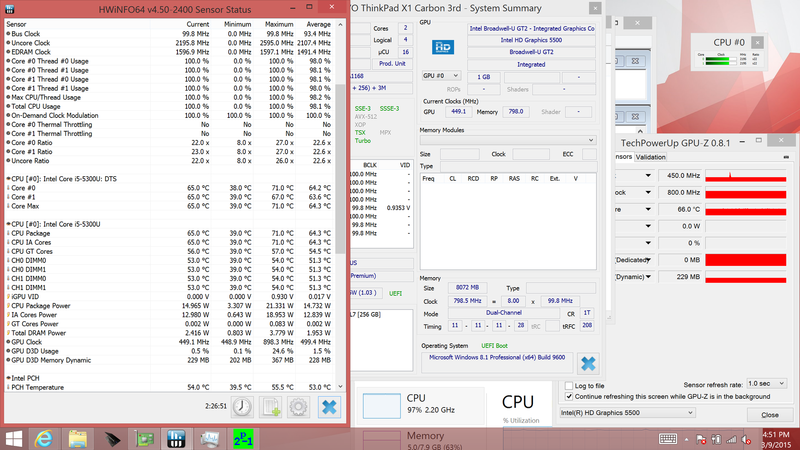 For instance, in Cinebench R15 xCPU 64-bit, the Dell Latitude E7250, E5550, and E7450 laptops all score between 264 and 280, but the X1 Carbon only manages 250. Likewise in 3DMark 06 CPU, where those same candidates post scores ranging from 3652 to 3704, but the X1 Carbon squeaks out a 3404. With regard to practical use, this has minimal effect on the system’s overall speed, however. 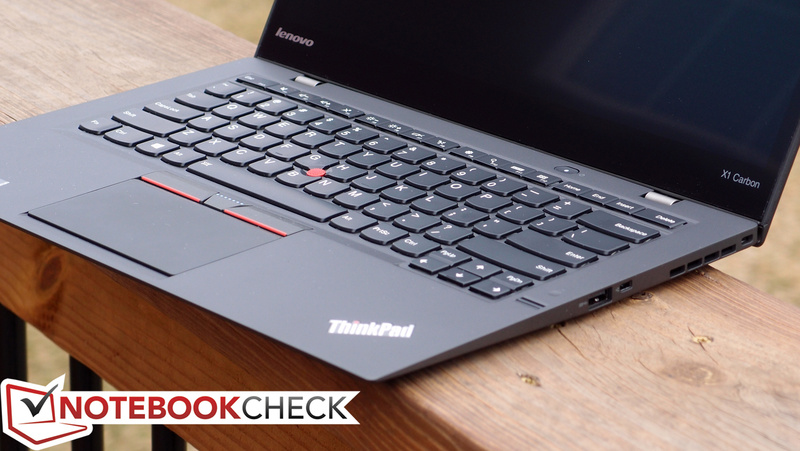 As we’ll examine in the next section, we had no qualms about the X1 Carbon’s capability to get things done. The performance of the Core i7-5500U model is a bit disappointing as well: The XPS 13 with the identical CPU is around 10 percent faster in multi-thread scenarios; a Core i5-5200U already reaches the performance of the X1 Carbon with the Core i7. 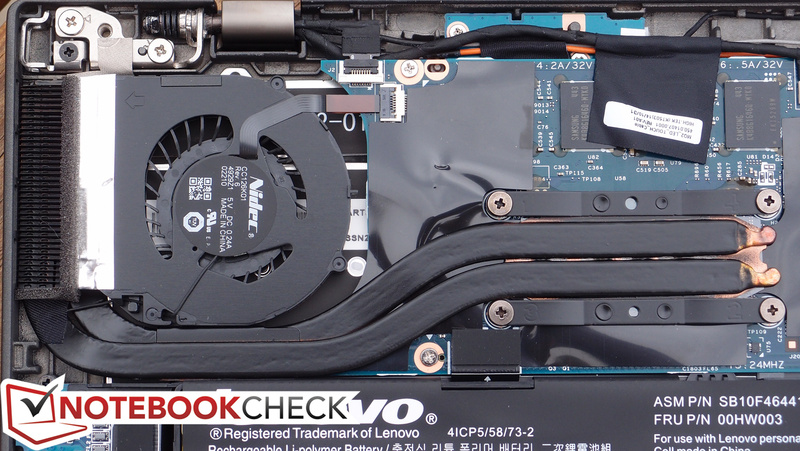 Our analysis shows that the ThinkPad reaches the CPU TDP limitation of 15 Watts comparatively early, so it can only maintain a clock of 2.4 GHz – which is the reason for the mediocre benchmark results. We cannot determine this problem in single-thread scenarios, so the performance is comparable with other Core i7-5500U devices. All in all we cannot recommend an upgrade from the Core i5-5300U to the Core i7-5500U for the X1 Carbon because of the small differences. In terms of general system performance, the X1 Carbon feels capable and nimble throughout daily use. Our tests of everyday application performance using PCMark 8 and 7 agree with our sentiments: in both, the machine competes with a number of other category leaders. 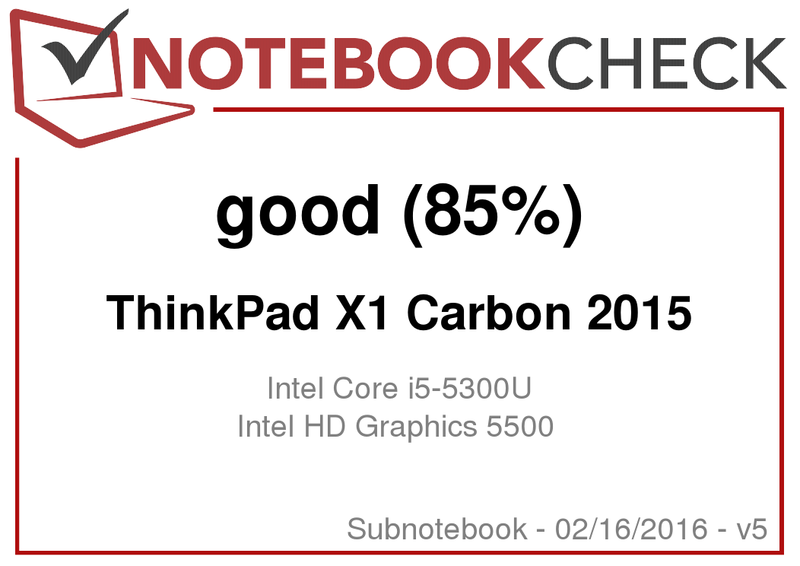 For instance, in PCMark 7, the X1 Carbon’s score of 4943 is nearly equal to the XPS 13’s 4934, and just barely below the MacBook Air 13’s 5012. The story is even better with PCMark 8 Home Score Accelerated v2, where the very good result of 2778 actually beats the aforementioned machines (MacBook Air 13: 2584, XPS 13-9343: 2582). 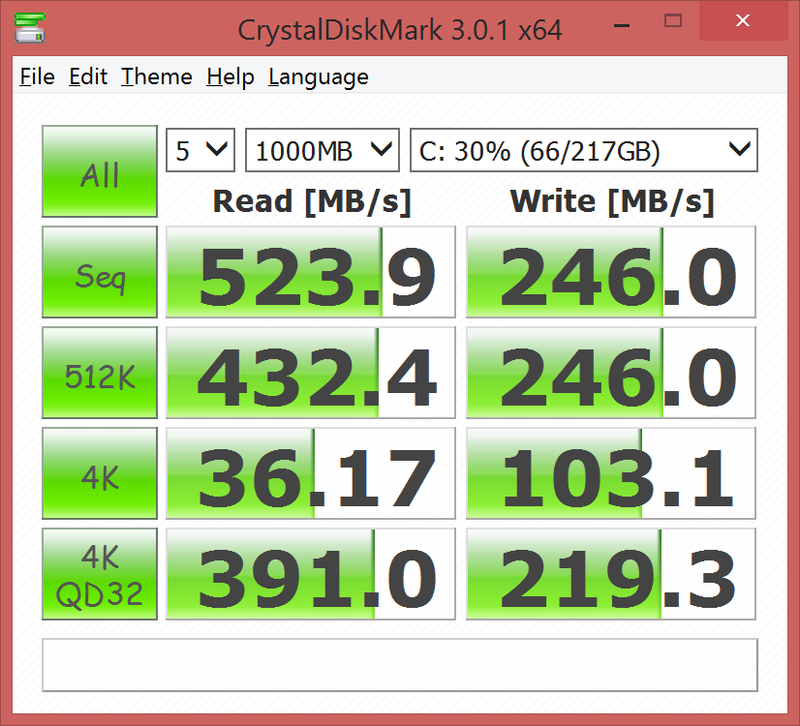 However, it’s worth mentioning that in spite of these great results, they’re still below those of the X1 Carbon Gen 2 we reviewed—specifically because of the choice of SSD it seems, as that model’s 512 GB Samsung PM841 drive possessed write speeds that were on average 80 MB/s better than the Gen 3’s Samsung PM851. Only solid-state drives are available for the X1 Carbon. These range in capacity from 128 GB up to 512 GB (for an outrageous $700 premium to boot). Our review unit came outfitted with a 256 GB SSD; specifically, a Samsung PM851 (model MZNTE256HMHP), which is an Opal-capable M.2 80mm drive. It’s also easy to replace (located just behind the back cover, removable as described earlier)—so going with the cheapest option and upgrading aftermarket is a great option to save some cost. 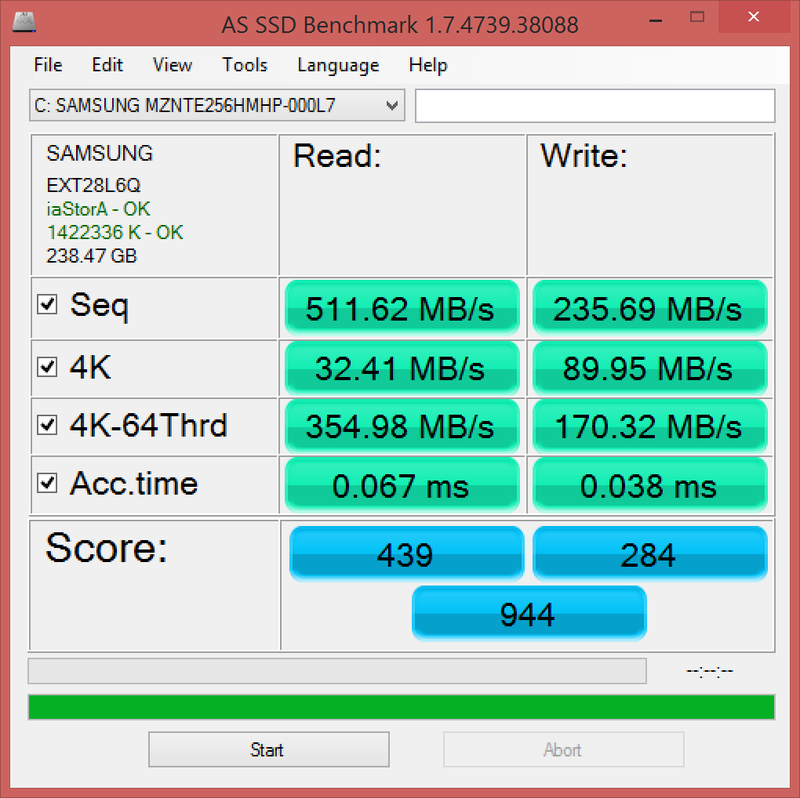 Apart from capacity and expense, one other reason to consider aftermarket replacement is the performance of the stock SSD: the Samsung drive we received in our test unit falls short of the best SSDs. Write speeds on this particular model remain below 250 MB/s in all circumstances; however, read speeds exceed 500 MB/s, which is very good. AS SSD awards it a respectable 944 points. The 512 GB SSD of the high-end configuration is not a simple SATA drive, but a significantly faster PCIe-SSD – those drives were mainly limited to some Apple devices so far. The new X1 Carbon is equipped with a Samsung SM951 M.2-2280 SSD, which is attached via four PCIe lanes (unfortunately only PCIe 2.0 because it is attached via PCH). 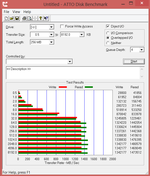 Without the limitation of the SATA interface we can measure enormous sequential transfer rates of 1.3 GB/s (read) as well as 1.2 GB/s (write), which means the SSD is even faster than some RAID 0 configurations. The 4K results are very good as well, even though the faster interface only has an advantage with multiple parallel accesses (4K-64 tests). You can particularly notice the performance advantage of the PCIe-SSD when you copy large and connected files, although this scenario should be pretty rare for the majority of users. The performance of the drive is certainly impressive – but you should really think about the price-performance ratio before the purchase. 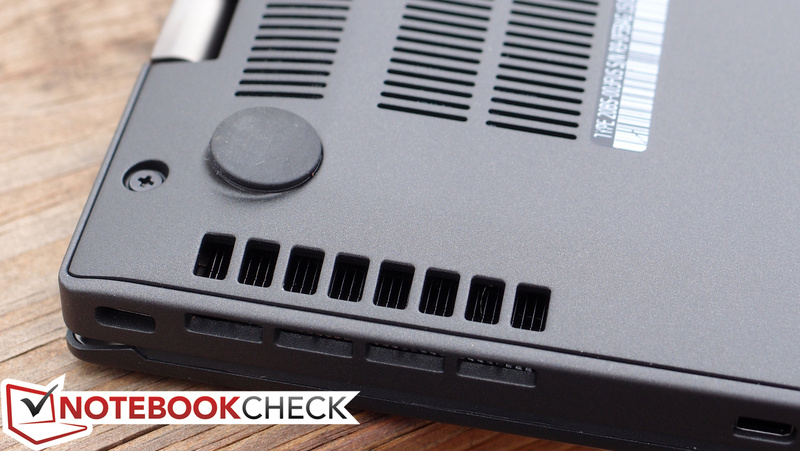 The X1 Carbon’s integrated Intel HD Graphics 5500 obviously isn’t meant to do any real heavy lifting, but it’s not completely incompetent, either. Its score in 3DMark Ice Storm of 45644 places it squarely in the middle of the pack of previously-tested units with the same CPU and GPU; likewise with the 1067 it received from 3DMark 11. The XPS 13 achieves slightly higher values in both places, but neither machine is truly meant for any sort of serious 3D horsepower. As compared with the X1 Carbon Gen 2, the Gen 3’s scores are higher across the board—most significantly with regard to Ice Storm, where a jump of nearly 30% is seen (from 35290 to 45644). 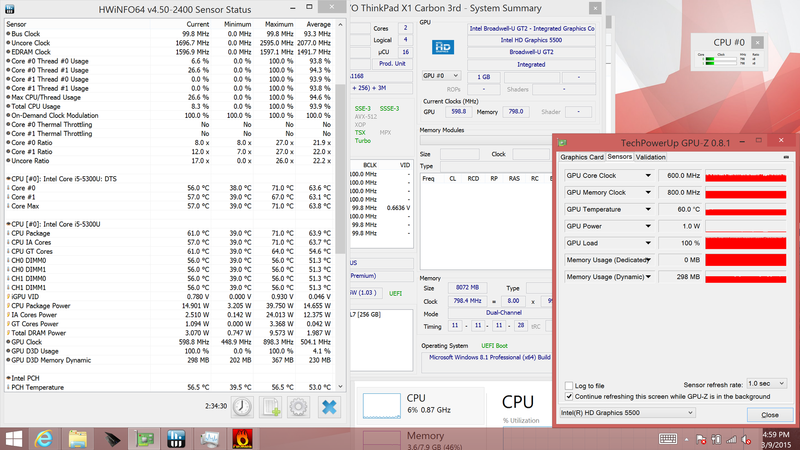 Like the Gen 2, while idle, the X1 Carbon Gen 3 is completely silent; the fan is turned off under such conditions. Under load, meanwhile, we recorded maximum values somewhat louder than those heard coming from the Gen 2—36.9 dB(A) vs. 34.0 dB(A)—but the median values actually dropped to 30.7 dB(A) from 33.7 dB(A). 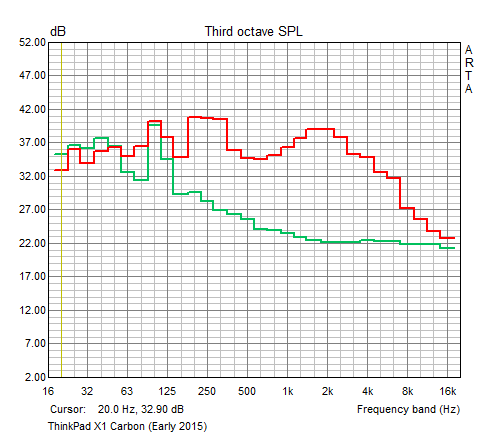 When compared with the Dell XPS 13, which reaches an ear-splitting 48 dB(A) under rare scenarios where extremely heavy load is imposed, the X1 Carbon wins hands down. What about the implications on case temperatures, however? Apparently the lower noise levels don’t bother the X1 Gen 3 all that much, as we recorded average temperatures on top and bottom of the unit of just 29 °C and 29.9 °C even under load. The hottest points, at the center top quadrant, still come in at just 36.2 °C and 38 °C, respectively. While idle, the machine is completely cool to the touch, without any notable variations in temperature. These temperatures are below those of the XPS 13, and the hot spots are considerably less noticeable than those on the Gen 2 (which were 3 °C and 4 °C warmer). (+) The average temperature for the upper side under maximal load is 29 °C / 84 F, compared to the average of 30.7 °C / 87 F for the devices in the class Subnotebook. (+) The maximum temperature on the upper side is 36.2 °C / 97 F, compared to the average of 35.8 °C / 96 F, ranging from 22 to 57 °C for the class Subnotebook. (+) The average temperature of the palmrest area of similar devices was 28.6 °C / 83.5 F (+2.8 °C / 5.1 F). Under CPU stress (using Prime95), the CPU eventually settles at just 2.2 GHz, reaching a maximum recorded internal temperature of 71 °C. That’s fairly cool considering, and it suggests a familiarly restrictive thermal management policy by Lenovo’s firmware. The same situations applies with regard to GPU stress, where clock rates rest at close to 600 MHz—far below the 900 MHz ceiling set by the chipset for the GPU. 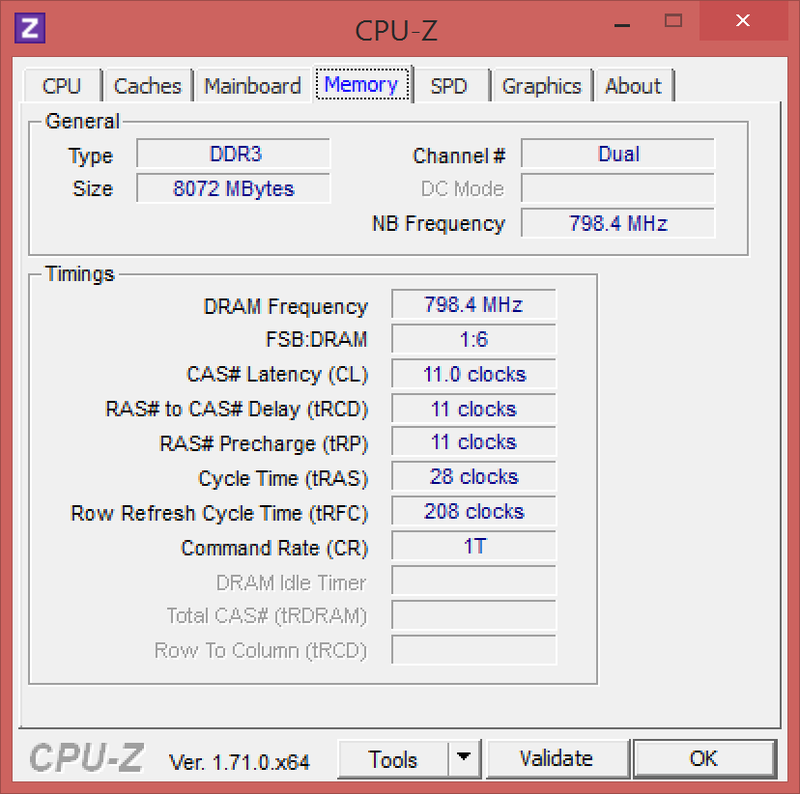 Under both CPU and GPU stress simultaneously, the system immediately throttles the CPU clock rate to just 1.1 GHz, while the GPU drops to 550 MHz. Temperatures still never crack the 71 °C mark. Workstation this is not; under any degree of stress, the X1 Carbon buckles fairly quickly. The two bottom-mounted, down-firing speakers on the X1 Carbon depend on the existence of a flat, hard surface underneath them for a fuller sound via the benefits of reverberation (as do all down-firing configurations). Out of the box, the speakers are loud, and even at full volume there is no distortion detectable. The Dolby Digital Plus post-processing software—which we have, against all odds, more recently taken a bit of a liking to—is set by default to the “Movie” preset, and some users may not appreciate the echo which is produced by the simulated surround sound option which it incorporates. Easy enough; simply switch off that feature or change the preset to something else (such as “Music”) and the effect disappears. The resulting sound under the Music profile is probably the best, and it’s very clear, moderately loud, and lacking in low frequency response (which is hardly surprising). The Carbon’s speakers can’t achieve the surprisingly full sound profile of slightly larger notebooks—such as the Dell Latitude E7440, whose speakers are excellent for their size—but it’s still more than enough to suffice for everyday use, at least until movie-watching or music-listening becomes an extended activity. With all this talk about the efficiency of the Broadwell chipset, how much does the X1 Carbon benefit from the jump to the next hardware generation? Coupled with the 50 Wh battery (up from 45 Wh on the Gen 2 X1 Carbon), we should be able to expect longer runtimes. 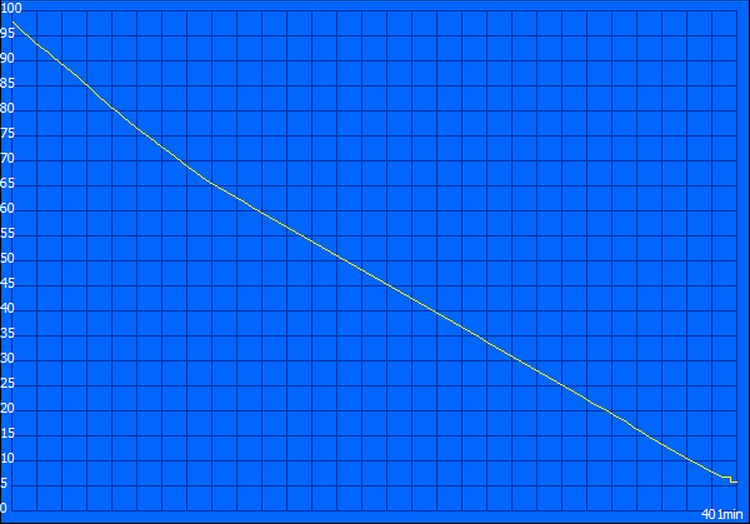 In reality, practical runtimes haven’t changed much. The Reader’s Test result of 16 hours and 24 minutes is very good, but brightness is so low under these conditions that it’s almost unusable (X1 Carbon Gen 2: 12:03). Under load, meanwhile, for the Classic Test, we recorded 2 hours and 21 minutes, which is indeed better than the Gen 2 model by around 30 minutes. Both values also slightly edge out the Dell XPS 13’s results (15:12 and 2:20 respectively). However, the most relevant test for most people is probably the Wi-Fi Surfing Test, which simulates everyday web surfing by visiting a series of predetermined sites at regular intervals. At first glance, the X1 Carbon Gen 3’s results may appear to have even worsened, but a bit of explanation is in order: we’ve since made significant changes to our Wi-Fi Surfing routine, such that all notebooks are likely to see their results drop in the future. To help compensate for this during our comparisons in this review, we ran both the old test and the new test. The new test, which is a fairly accurate estimate of how long the battery is actually likely to last for most avid users, allowed the X1 Carbon Gen 3 4:45 before it shut off. Under the old Wi-Fi Surfing Test, for sake of comparison, the Gen 3 posted a much more respectable 6:41—slightly above the Gen 2’s 6:29 in that same benchmark, but far below the XPS 13-9343’s 9:40 (which is an excellent result). In short, this is likely to translate to fairly good battery life during daily use, but thanks to the more demanding nature of modern web surfing activity (i.e. videos, plugins, and lots of dynamic content), our new test likely provides an even more pertinent result. Looking at the comparisons, though there’s nothing to be concerned about here, it’s a little puzzling that we don’t see better runtimes from the larger battery and more efficient chipset. Certainly the screen should not play much into this equation. We were a bit disappointed by our results here. 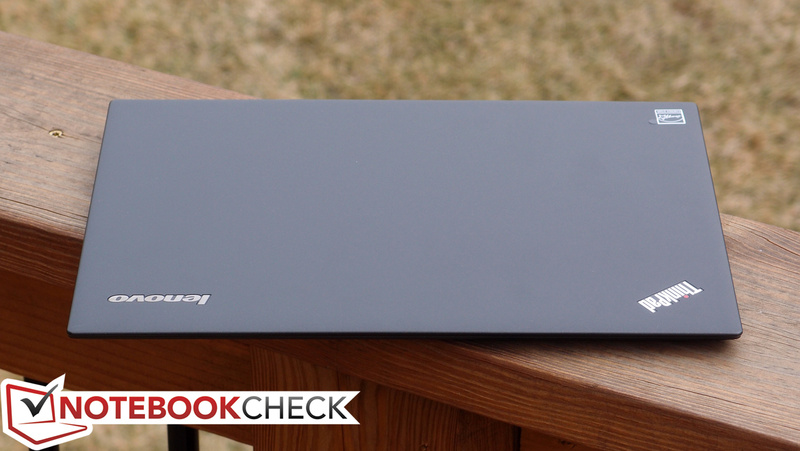 The Lenovo X1 Carbon 3rd Gen is a beautiful machine. Much like the Dell XPS 13 took the initiative to cram a 13-inch screen into an 11-inch form factor, the X1 Carbon sports dimensions that are more comparable to a typical 13-inch machine—and that includes its weight and thinness, both of which are indisputably manageable. It’s also practically designed; the matte black surfaces that comprise the majority of the case are minimalist and attractive, but they’re simultaneously haptically comfortable, with an unmistakably cool metal feel and a comfortable fit for use on both lap and desk. The case also feels fairly solid, though the incidence of flex and relative lack of torsion resistance in some regards gave us pause. 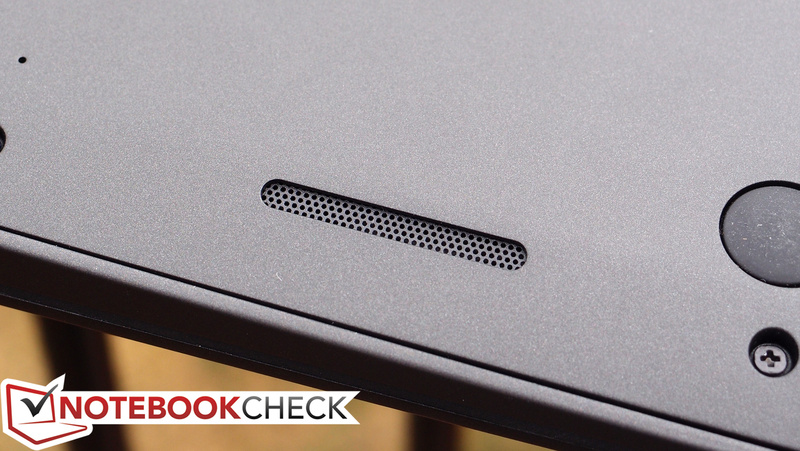 Perhaps more exciting, however, is what has improved over the X1 Carbon 2nd Gen. Criticism of the 2nd Gen’s radical (and arguably illogical) keyboard design and polarizing full-depression clickpad scared away many prospective buyers—as such fearlessly progressive and experimental design decisions generally don’t fit well with the business market, where practicality rules supreme. The Gen 3 wholeheartedly acknowledges these complaints and implements a complete reversal of those decisions. 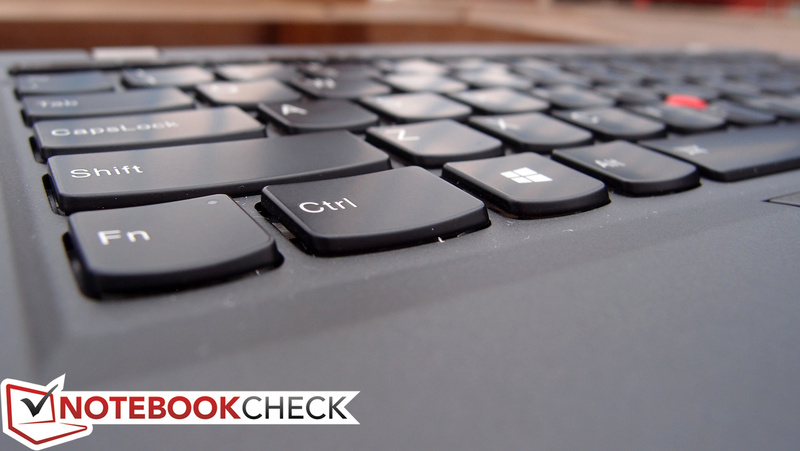 As a result, the keyboard—immediately familiar and accessible—is one of the absolute best we have ever used on an Ultrabook. 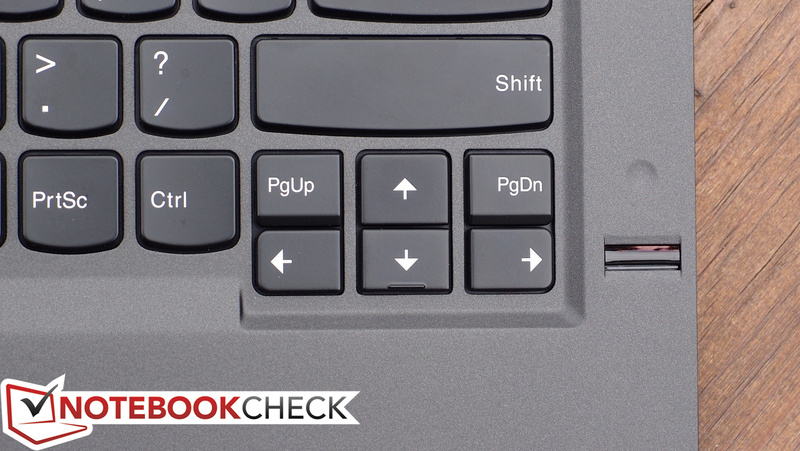 Meanwhile, the three classic top-mounted physical buttons for use with the Trackpoint have returned, and the touchpad itself ditches the controversial full-click design in favor of a far more comfortable (and, in our judgment, reliable) clickpad approach. 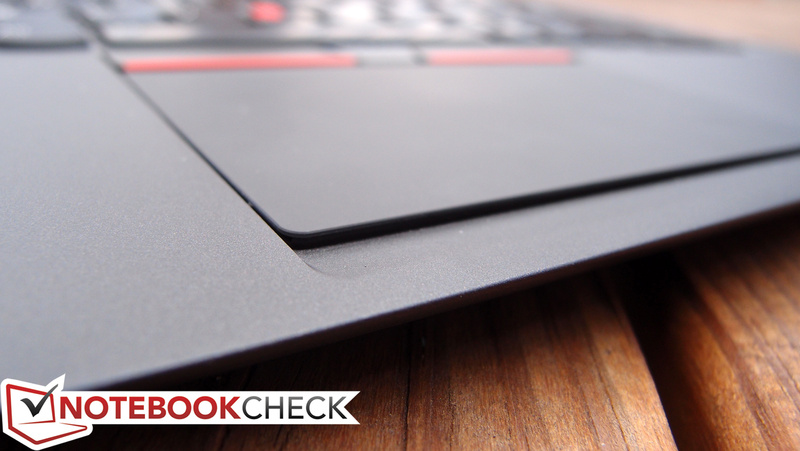 The end result is that the X1 Carbon Gen 3 features some of the best input devices we’ve tested on an Ultrabook. What about performance? CPU performance differences between the 2nd Gen and 3rd Gen X1 Carbon models were essentially nil in our testing—for all intents and purposes, the machines are identical in this regard. However in GPU testing, we witnessed a notable speed boost—in some cases up to 19% better. 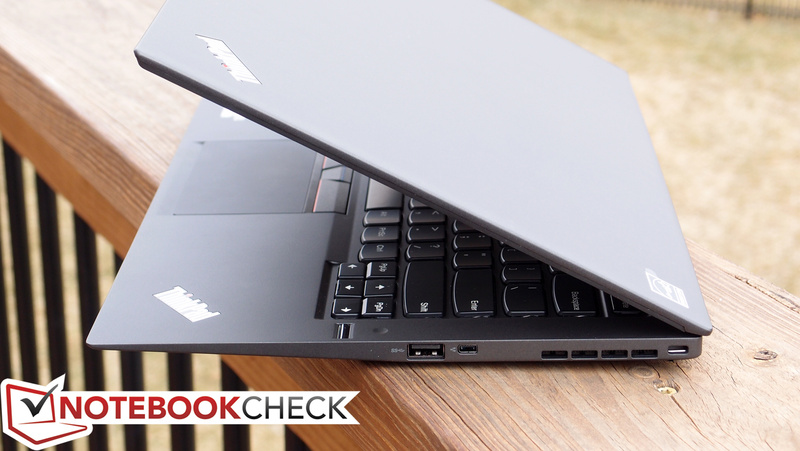 As compared with other modern notebooks of its class, apart from some multi-core synthetic performance hiccups, the X1 Carbon 3rd Gen holds its own, both in terms of CPU/GPU and general system performance. 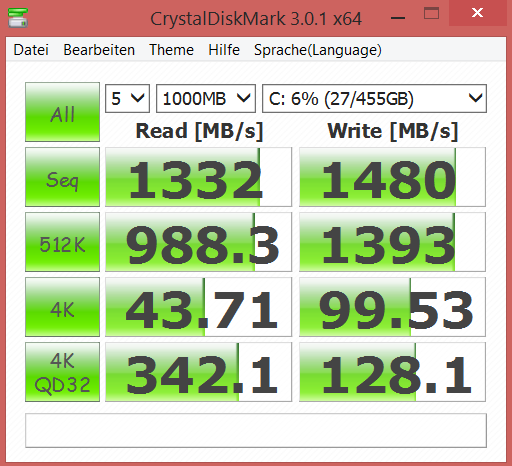 The only final niggle here is the Samsung PM851 SSD, whose write speeds are conspicuously capped at around 250 MB/s. 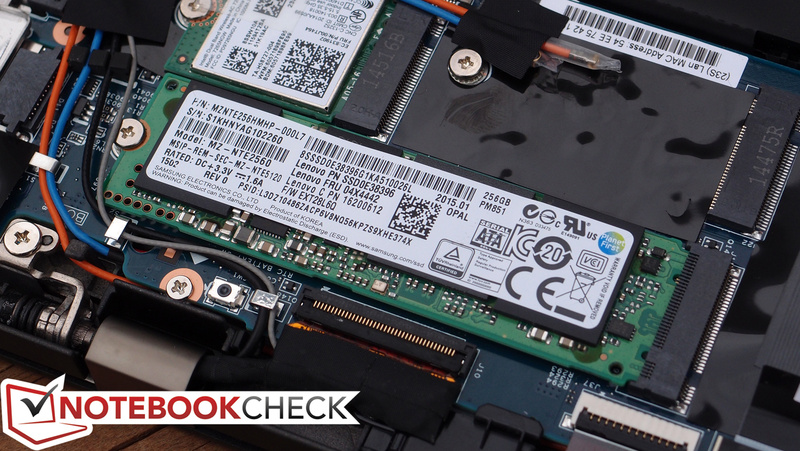 While the leap to a Broadwell chipset and slightly larger battery seemed sure to promise improved battery runtimes, we were surprised to find throughout our testing that there wasn’t much of a difference at all. Our classic Wi-Fi Surfing Test produced a result only slightly better than that of the 2nd Gen, and the revised Wi-Fi test we just recently implemented—which is more broad and aggressive and arguably closer to actual real-world usage patterns—recorded under five hours before the machine shut down. That’s hardly an impressive number on one hand given the 50 Wh battery and supposed enhanced efficiency, though it’s still likely to get most users through a typical trip unplugged, especially if more restrictive power savings options are employed. 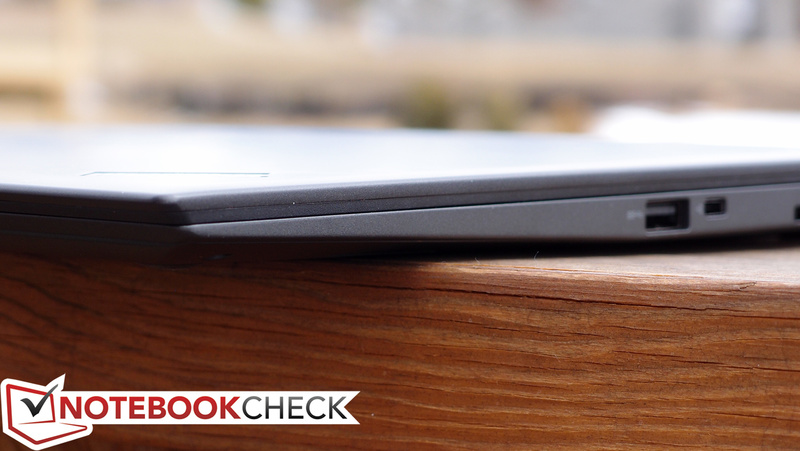 If longer battery life is a priority, we’d suggest taking a look instead at the Dell XPS 13-9343 or the MacBook Air 13. 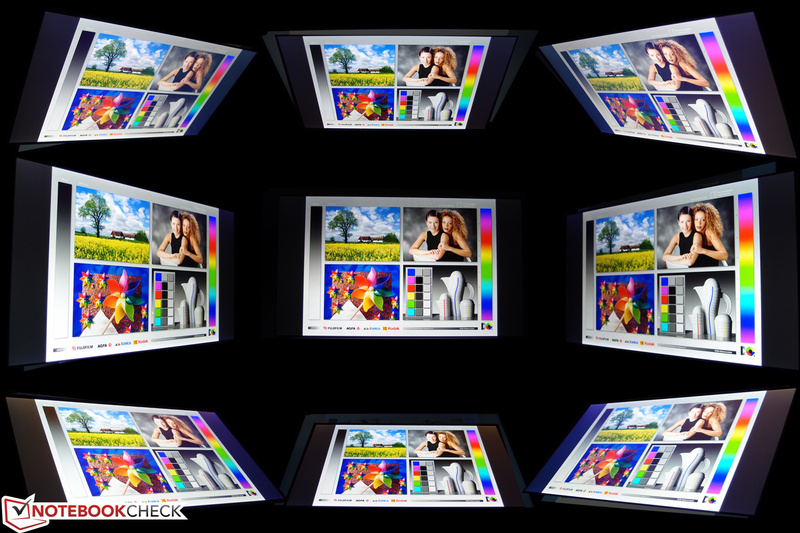 Rounding out the list of considerations is an underwhelming screen, at least in terms of brightness, contrast, and color saturation—though we do most certainly appreciate the anti-glare display filter for both its diffusion of reflections and relative ease of cleaning. The X1 Carbon Gen 3 is also invariably cool and quiet, clearly favoring comfort over top-end performance (as we discovered during our stress testing of the device). Summing up, the X1 Carbon Gen 3 is indisputably superior to its predecessor. Although some of these improvements come in the form of better GPU performance, cooler temperatures, and lower average system noise levels, the vast majority of them center on the thankful retreat from the experimental (and finicky) input devices of the Gen 2 design and back to sanity. 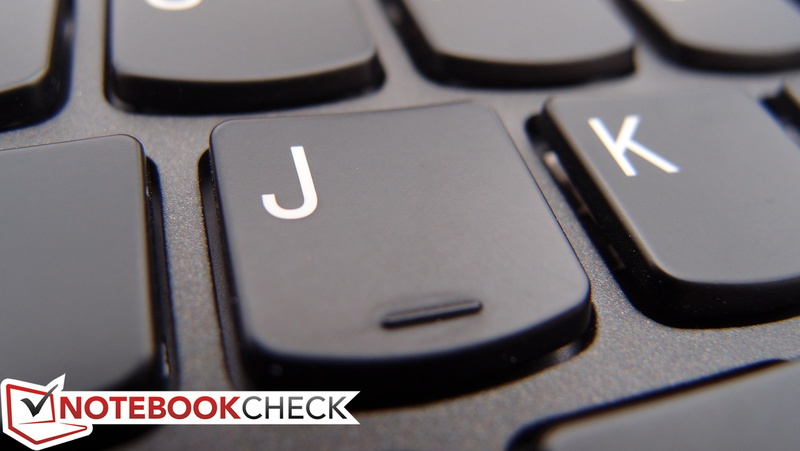 This isn’t just a return to form, either; to reiterate, by our judgment, they are some of the best input devices on any Ultrabook we’ve tested to date. But in spite of this self-improvement, how does the X1 Carbon compare with its modern competitors? In truth, though it’s a compelling option, it’s lost some ground since our last encounter. While notebooks such as the MacBook Air 13 and (especially) the Dell XPS 13-9343 have sprinted forward with such massive improvements in portability, battery life, and LCD quality, the X1 Carbon 3rd Gen has only marginally improved, mostly regaining footing it’s lost elsewhere. It’s still a strong contender, and it’s certainly the best Carbon to date, but especially at a pricey $1,574, we fear that its inability to innovate further may relegate it to the shadows of these more aggressive contenders. The keyboard is just excellent.